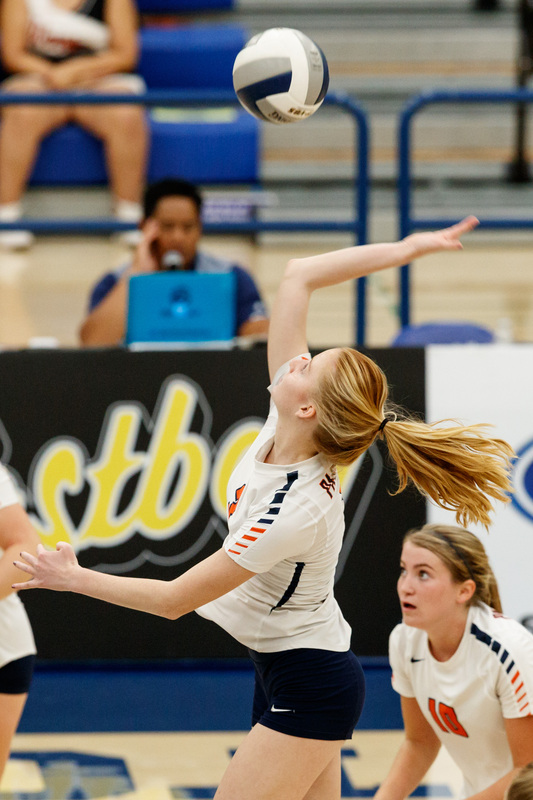 See the Orange Region Register’s images of the region’s completing Saturday in the ladies beach ball national championship at Cerritos University. Most likely to the OCVarsity pages to check out the video games. Los Alamitos players swarm the court as they beat Trabuco Hills during the championship video game of the CIF-SS Department 2 women beach ball playoffs Saturday, Nov. 3, 2018 at Cerritos University. 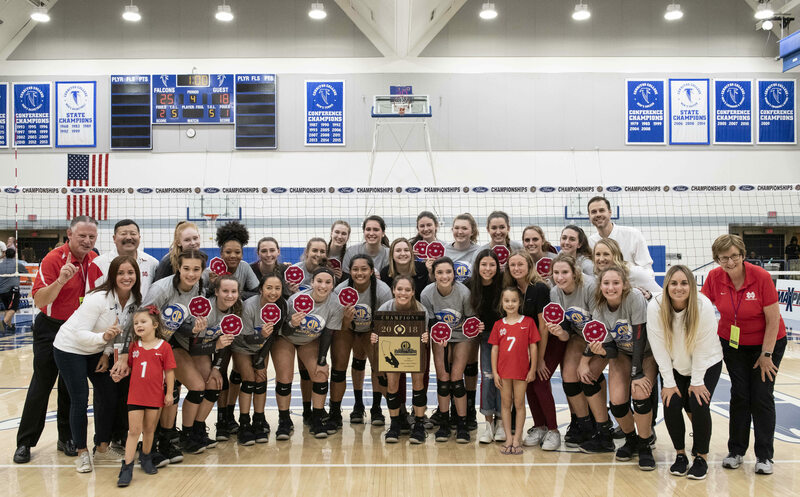 Mater Dei team commemorate the CIF-SS Division 1 Champion suit gain Marymount at Cerritos College in Norwalk on Saturday, November 3, 2018. (Photo by Kyusung Gong/Contributing Professional Photographer). 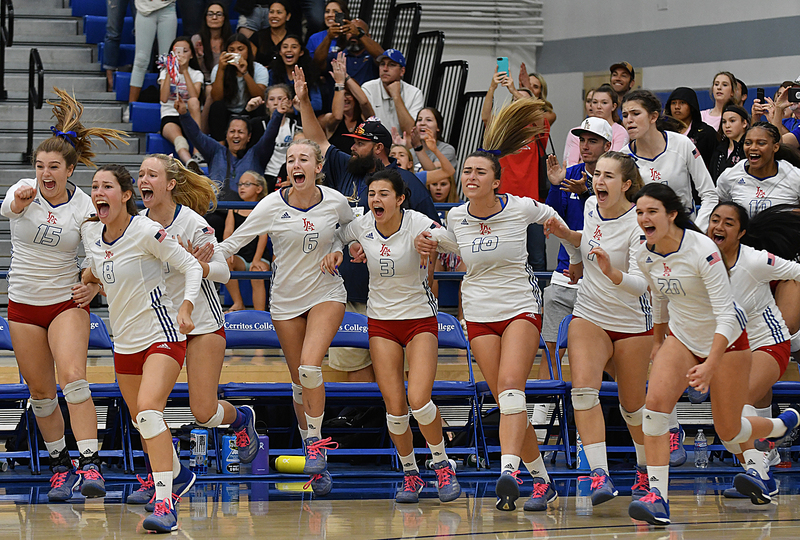 Los Alamitos players celebrate after beating Trabuco Hills throughout the championship video game of the CIF-SS Division 2 ladies beach ball playoffs Saturday, Nov. 3, 2018 at Cerritos University. ( Image by Michael Fernandez, Contributing Photographer). 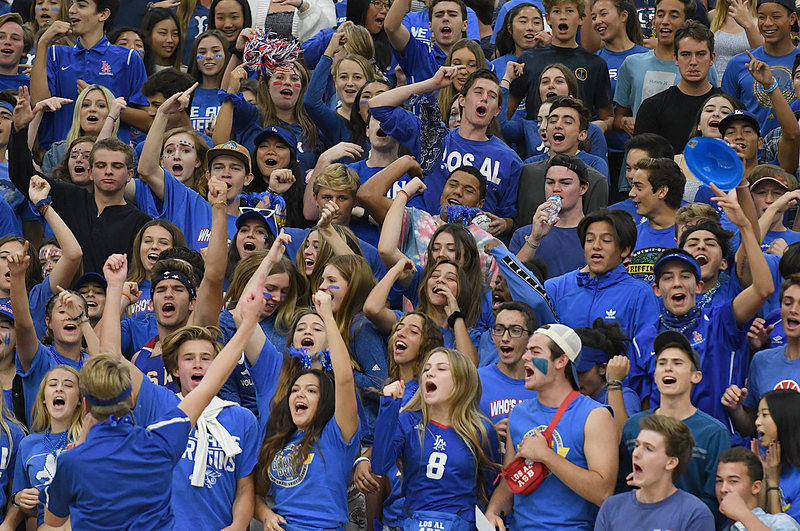 Marymount followers applaud for the team throughout the CIF-SS Department 1 Champion suit versus Mater Dei at Cerritos University in Norwalk on Saturday, November 3, 2018. (Picture by Kyusung Gong/Contributing Digital Photographer). 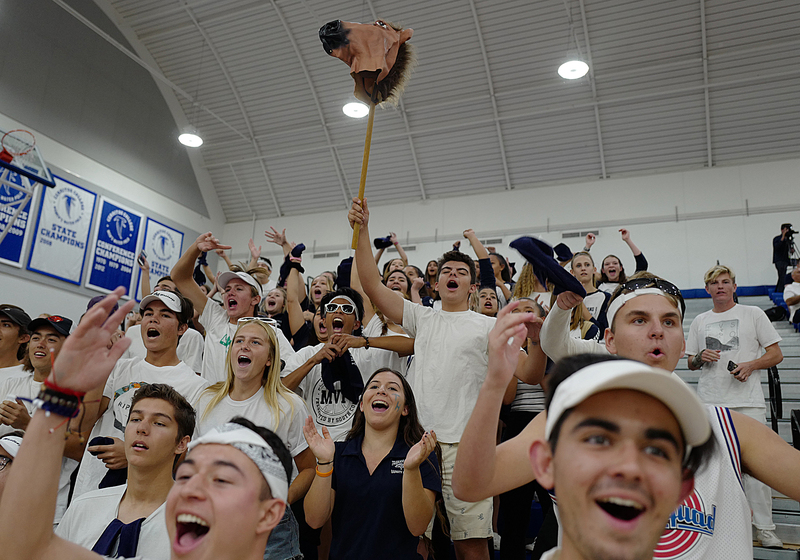 Trabuco Hills fans applaud for their team against Los Alamitos during the championship video game of the CIF-SS Department 2 women beach ball playoffs Saturday, Nov. 3, 2018 at Cerritos College. 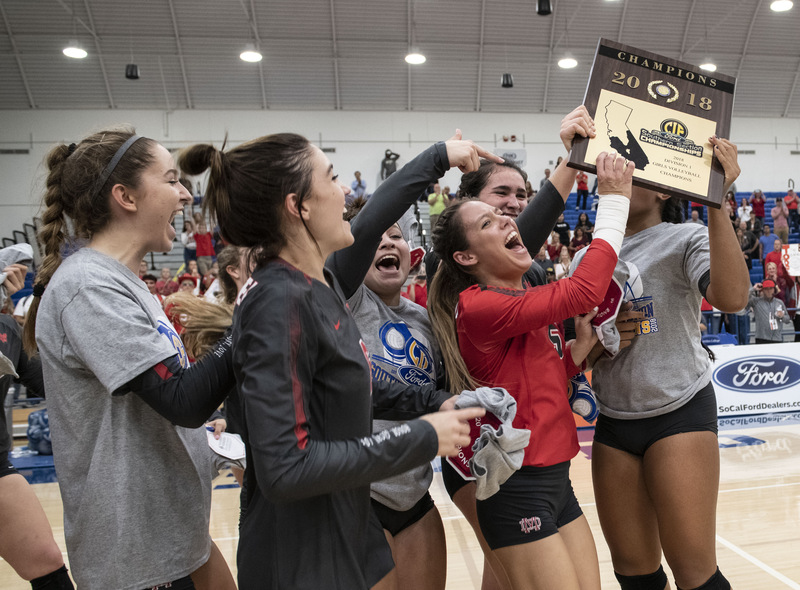 Mater Dei team celebrate with the CIF-SS Division 1 Champion plaque after beating Marymount at Cerritos University in Norwalk on Saturday, November 3, 2018. (Picture by Kyusung Gong/Contributing Digital Photographer). 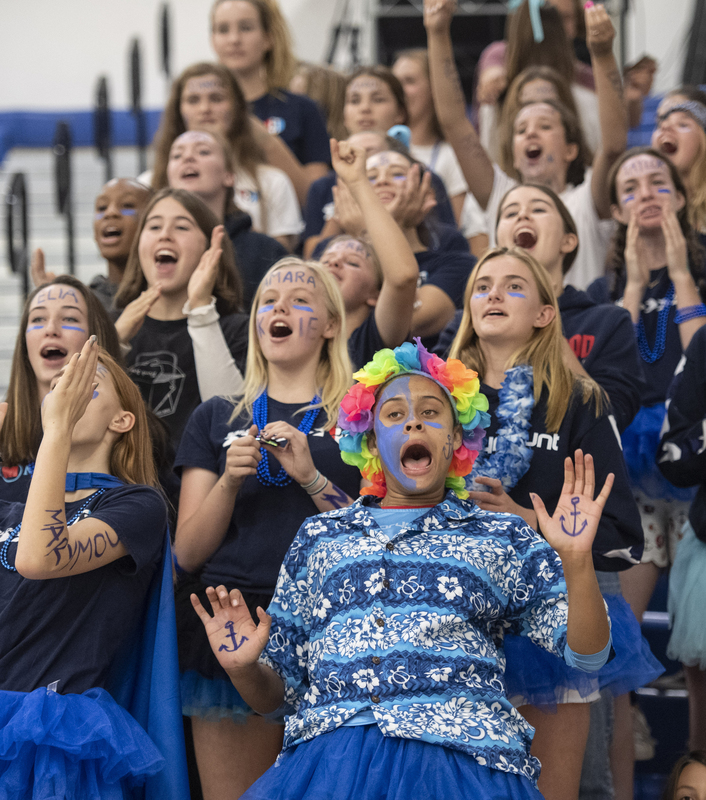 Los Alamitos fans cheer versus Trabuco Hills during the national championship of the CIF-SS Division 2 women volleyball playoffs Saturday, Nov. 3, 2018 at Cerritos College. ( Image by Michael Fernandez, Contributing Digital Photographer). 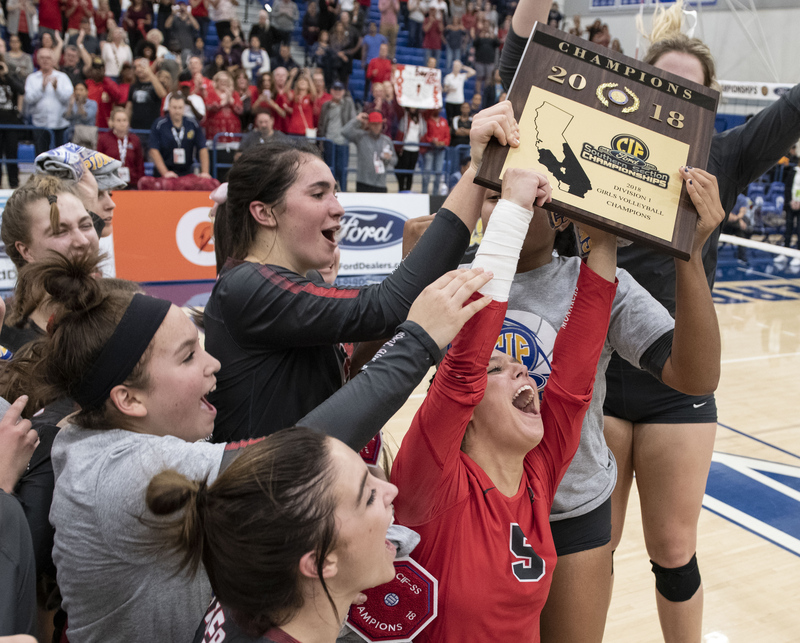 Mater Dei team present for a team photo after winning the CIF-SS Division 1 Champion match over Marymount at Cerritos University in Norwalk on Saturday, November 3, 2018. (Photo by Kyusung Gong/Contributing Professional Photographer). 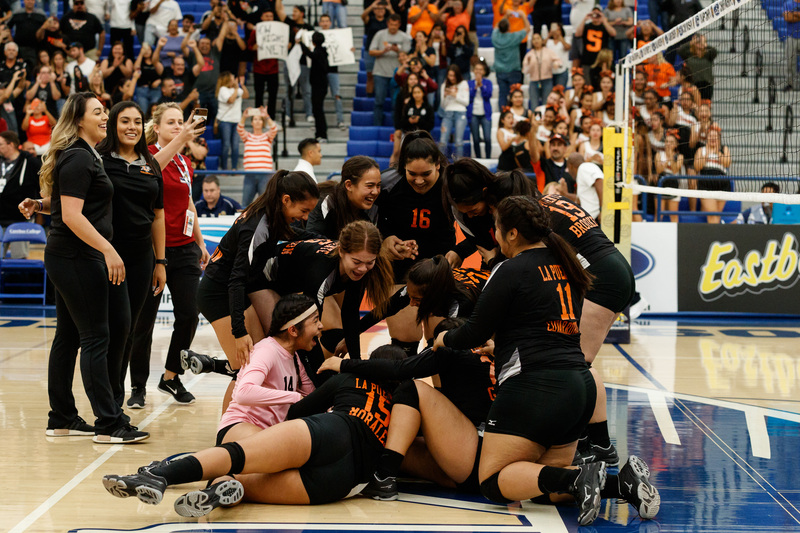 La Puente Warriors celebrates after wining the CIF-SS Girls Division 9 Champion suit versus the Pacifica Christian Tritons at Cerritos University in Norwalk, Calif. on Saturday November 3, 2018. La Puente defeated Pacifica Christian 3-2. (Photo by Raul Romero Jr, Contributing Photographer). 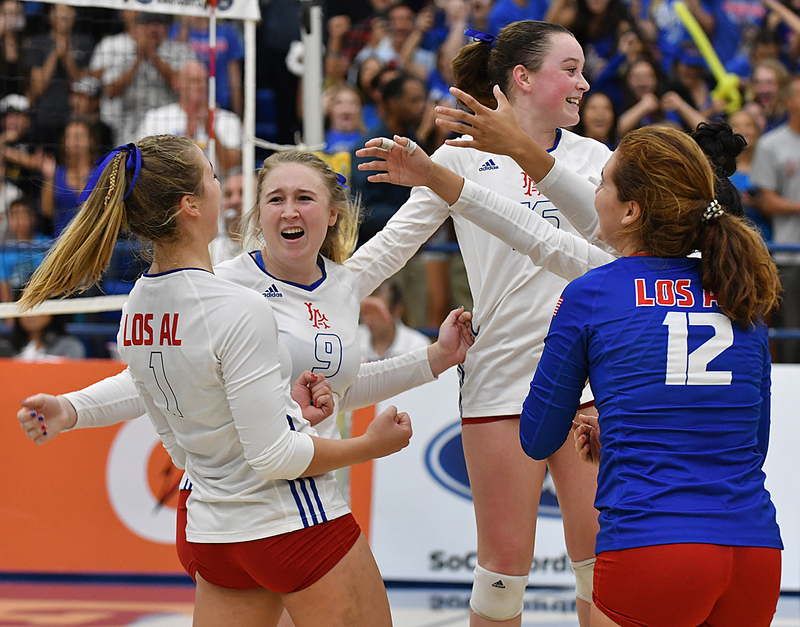 Los Alamitos players commemorate after defeating Trabuco Hills during the national championship of the CIF-SS Department 2 girls beach ball playoffs Saturday, Nov. 3, 2018 at Cerritos College. 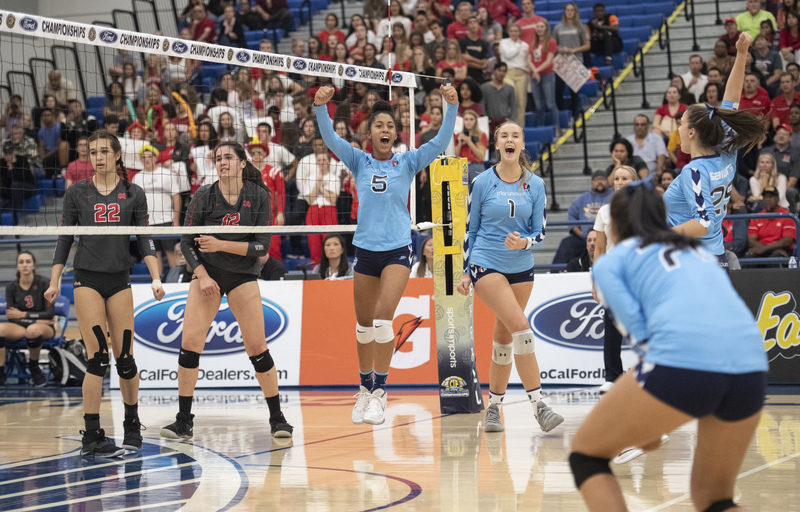 Pacifica Christian Tritons followers react to a score against the La Puente Warriors during the CIF-SS Girls Department Nine Championship match at Cerritos University in Norwalk, Calif. on Saturday November 3, 2018. La Puente beat Pacifica Christian 3-2. (Photo by Raul Romero Jr, Adding Digital Photographer). 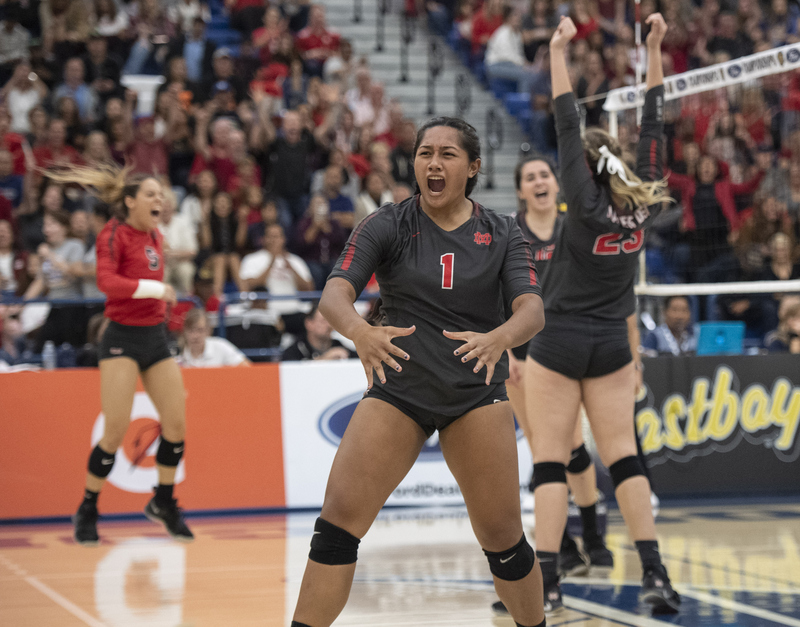 Mater Dei’s Mia Tuaniga, center, commemorates team’s factor during the CIF-SS Division 1 Champion match versus Marymount at Cerritos University in Norwalk on Saturday, November 3, 2018. (Image by Kyusung Gong/Contributing Photographer). 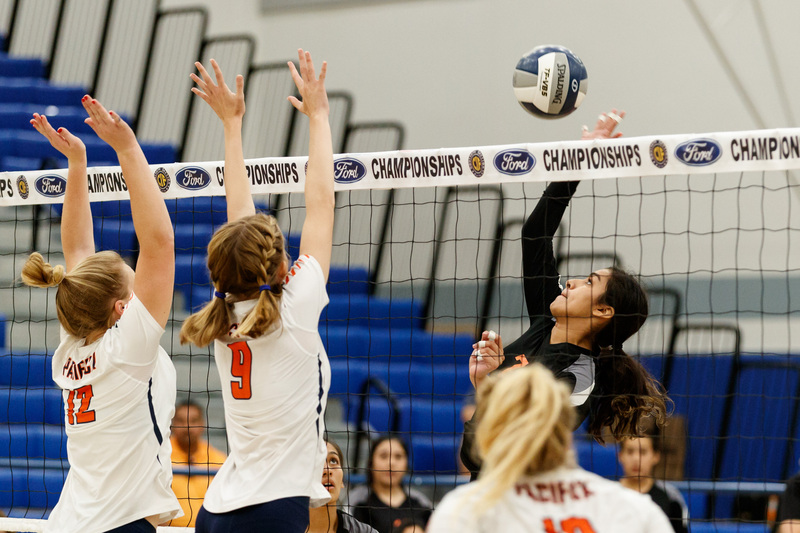 Pacifica Christian Tritons Maddy Alaluf (13) hits the ball as La Puente Warriors Alma Lopez (7) as well as Kayla Morales (15) attempt to block it during the CIF-SS Girls Division 9 Champion suit at Cerritos University in Norwalk, Calif. on Saturday November 3, 2018. La Puente beat Pacifica Christian 3-2. (Image by Raul Romero Jr, Adding Digital Photographer). 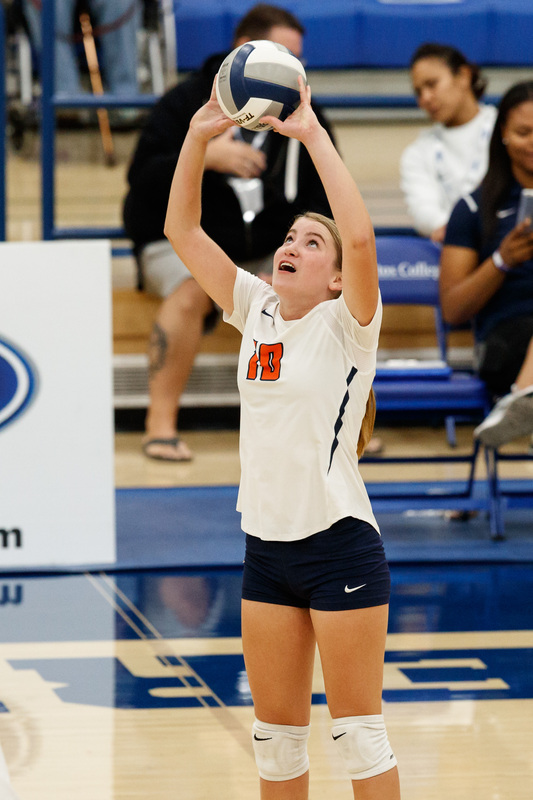 Pacifica Christian Tritons Breck Burwell (12) strikes the ball during the CIF-SS Girls Department Nine Championship suit versus the La Puente Warriors at Cerritos University in Norwalk, Calif. on Saturday November 3, 2018. La Puente defeated Pacifica Christian 3-2. (Image by Raul Romero Jr, Adding Digital Photographer). 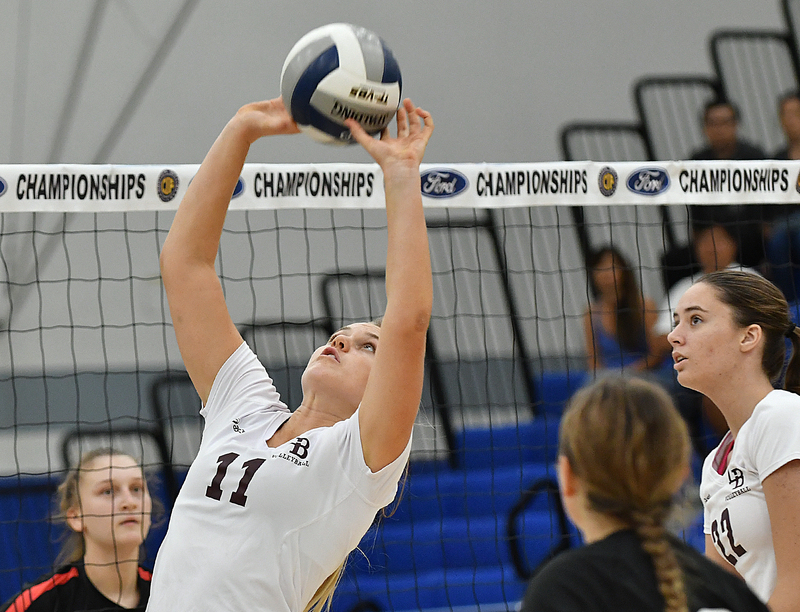 Laguna Beach’s Jacquelyn Strawn increases the round versus Town Christian throughout the national championship of the CIF-SS Division 3 ladies beach ball playoffs Saturday, Nov. 3, 2018 at Cerritos University. ( Picture by Michael Fernandez, Contributing Digital Photographer). 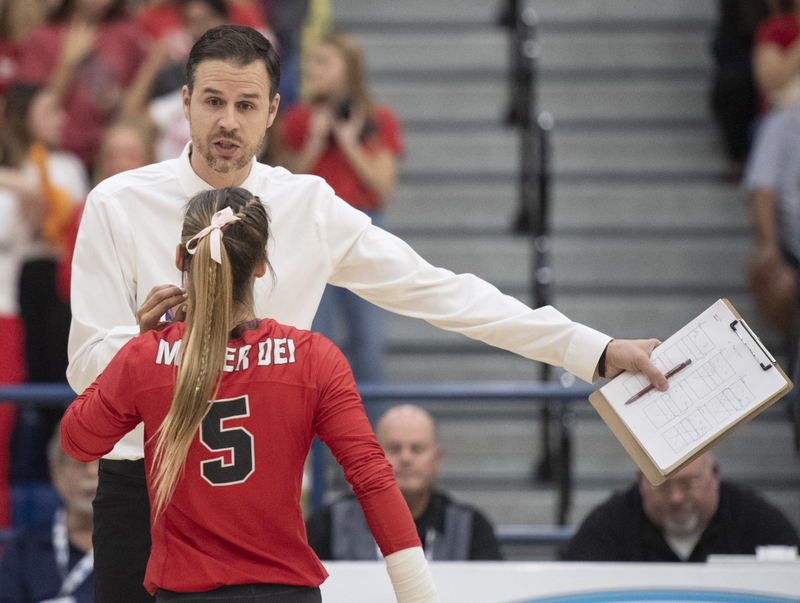 Mater Dei head trainer Dan O’Dell, back, gives directions to Mandalay Rennon during the CIF-SS Division 1 Championship suit versus Marymount at Cerritos College in Norwalk on Saturday, November 3, 2018. (Image by Kyusung Gong/Contributing Photographer). 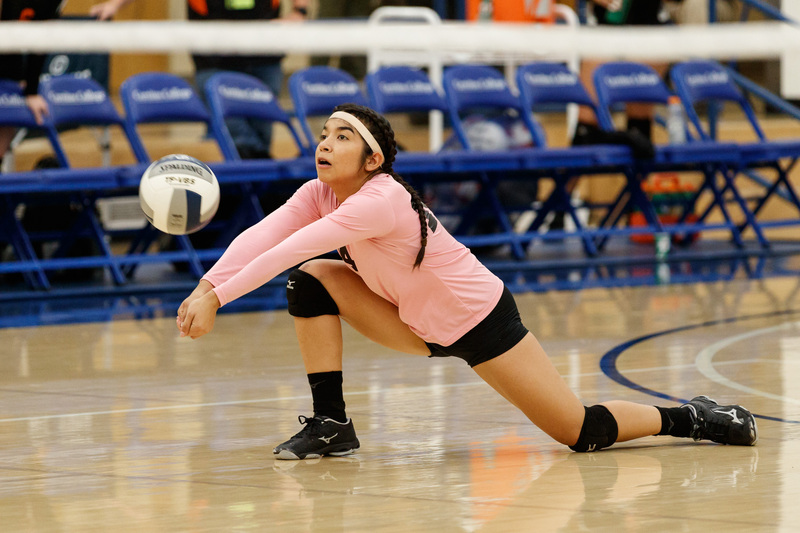 Pacifica Christian Tritons Carissa Penjoyan (14) digs for the sphere versus the Pacifica Christian Tritons during the CIF-SS Girls Division 9 Championship suit at Cerritos University in Norwalk, Calif. on Saturday November 3, 2018. La Puente beat Pacifica Christian 3-2. (Picture by Raul Romero Jr, Adding Professional Photographer). 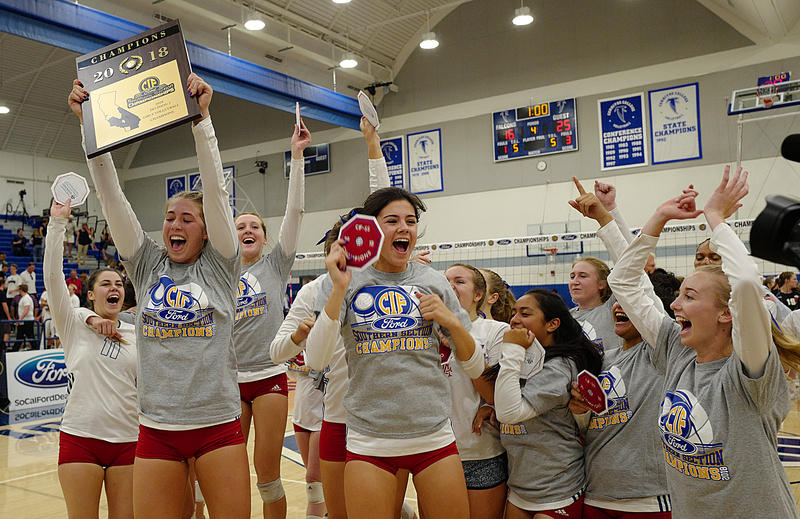 Mater Dei group commemorate with the CIF-SS Division 1 Champion plaque after defeating Marymount at Cerritos College in Norwalk on Saturday, November 3, 2018. (Picture by Kyusung Gong/Contributing Professional Photographer). 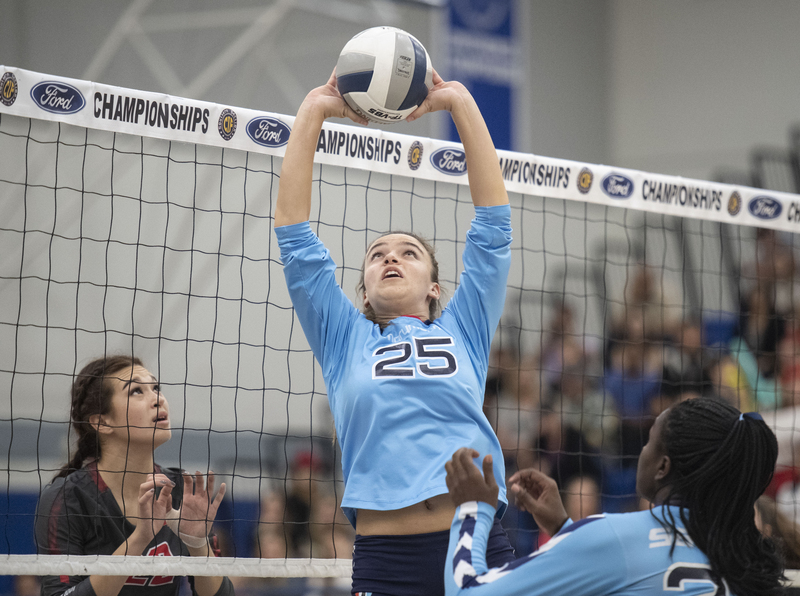 Trabuco Hills’ Kendall Anselmo taps the round over the web versus Los Alamitos during the champion game of the CIF-SS Division 2 girls beach ball playoffs Saturday, Nov. 3, 2018 at Cerritos College. 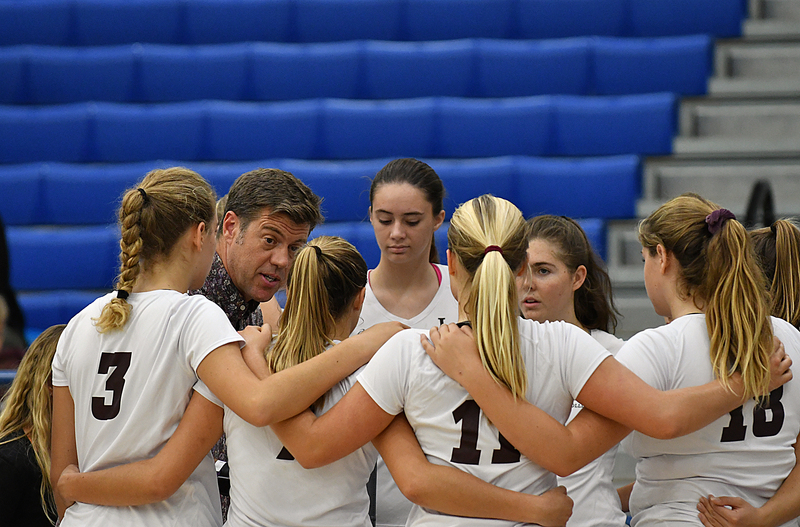 Laguna Coastline instructor Shawn Patchell speaks with his team while playing Village Christian during the championship video game of the CIF-SS Division 3 women volleyball playoffs Saturday, Nov. 3, 2018 at Cerritos College. 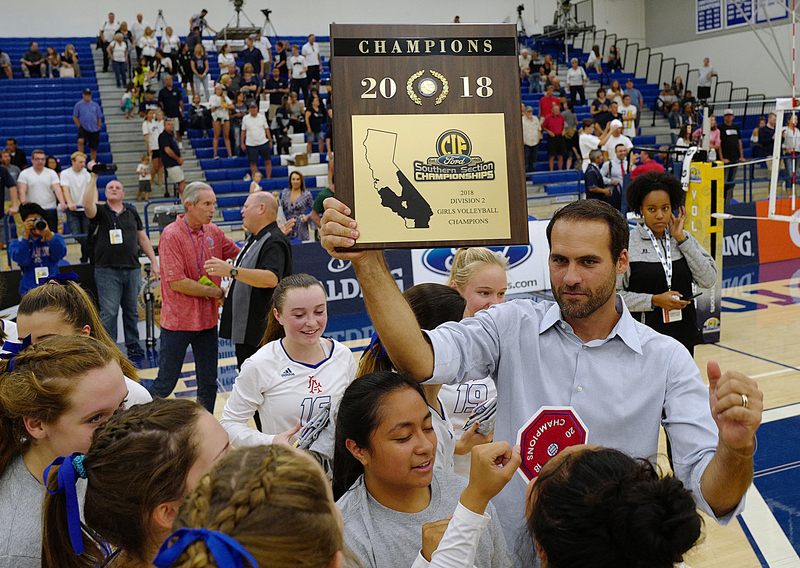 Los Alamitos train Dave Huber holds up the plaque after beating Trabuco Hills during the championship video game of the CIF-SS Division 2 ladies beach ball playoffs Saturday, Nov. 3, 2018 at Cerritos University. ( Photo by Michael Fernandez, Contributing Digital Photographer). 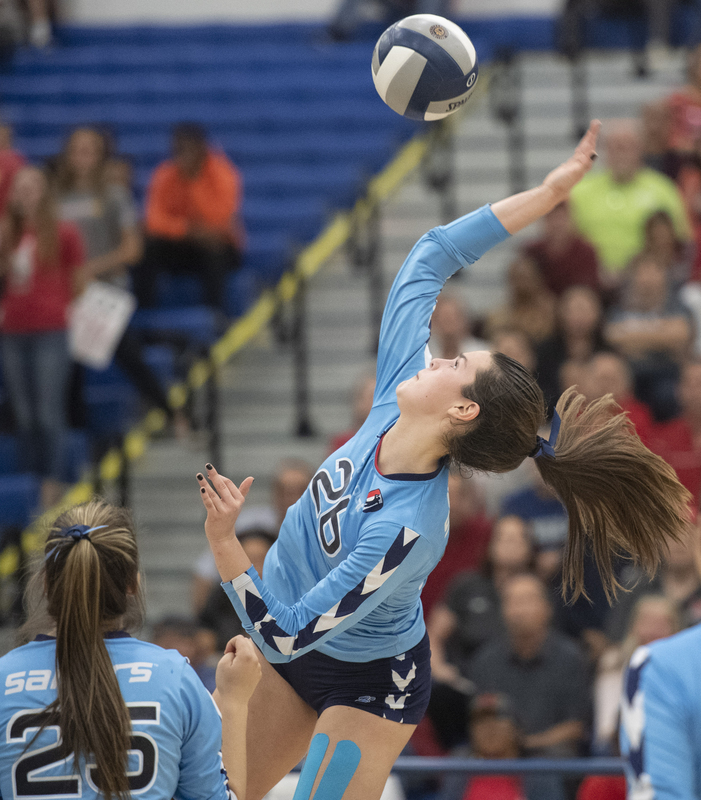 Trabuco Hills’ Jenna Halverson increases the round against Los Alamitos during the national championship of the CIF-SS Division 2 women volley ball playoffs Saturday, Nov. 3, 2018 at Cerritos College. 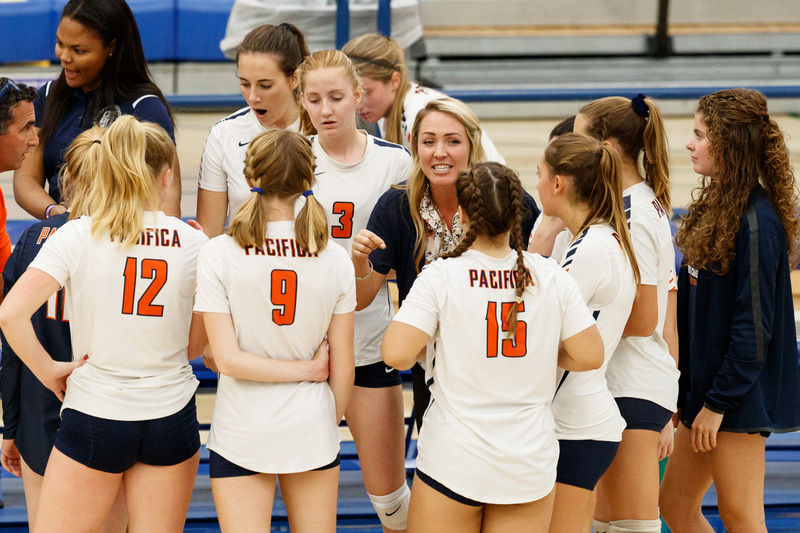 Pacifica Christian Tritons head coach Kimberly Adams talks with her team throughout the CIF-SS Girls Division Nine Champion suit against the La Puente Warriors at Cerritos College in Norwalk, Calif. on Saturday November 3, 2018. La Puente beat Pacifica Christian 3-2. (Image by Raul Romero Jr, Adding Digital Photographer). 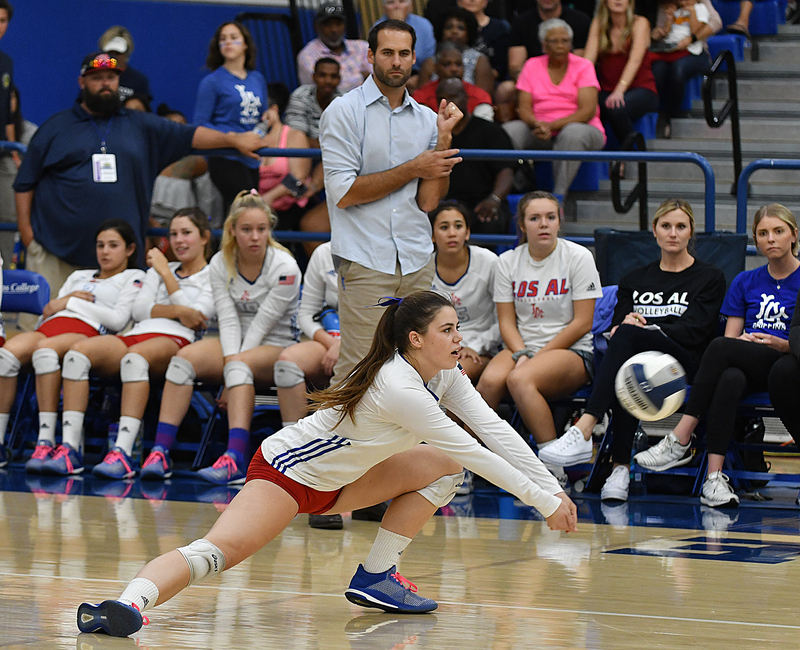 Los Alamitos’ Abby Blasi digs the round versus Trabuco Hills throughout the champion video game of the CIF-SS Department 2 women volleyball playoffs Saturday, Nov. 3, 2018 at Cerritos College. 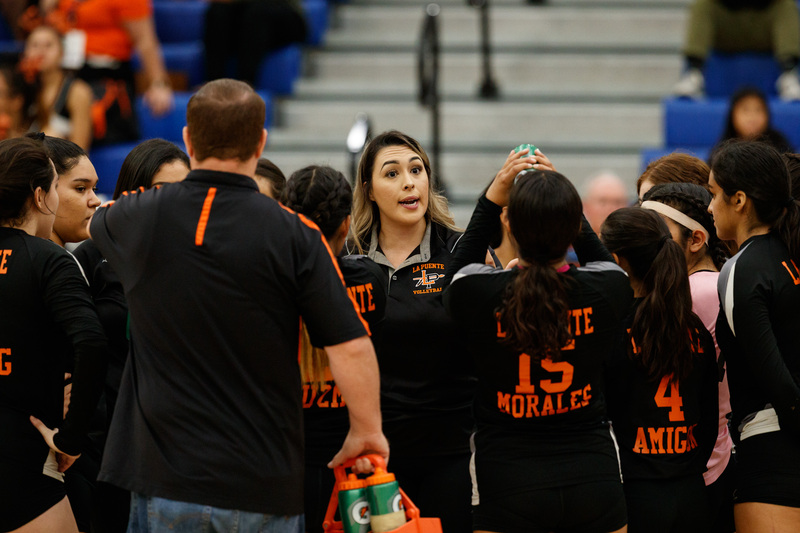 La Puente Warriors head trainer Elisa Valenzuela speaks with her team during the CIF-SS Girls Division 9 Championship suit versus the Pacifica Christian Tritons at Cerritos College in Norwalk, Calif. on Saturday November 3, 2018. La Puente beat Pacifica Christian 3-2. (Photo by Raul Romero Jr, Adding Professional Photographer). 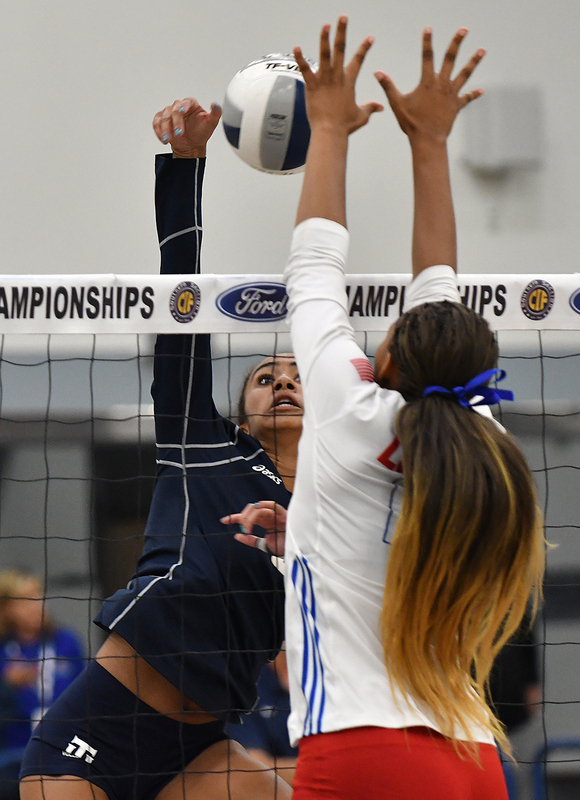 Los Alamitos’ Qitana Sapiga strikes the sphere backwards versus Trabuco Hills during the championship video game of the CIF-SS Department 2 women volley ball playoffs Saturday, Nov. 3, 2018 at Cerritos University. ( Image by Michael Fernandez, Adding Digital Photographer). 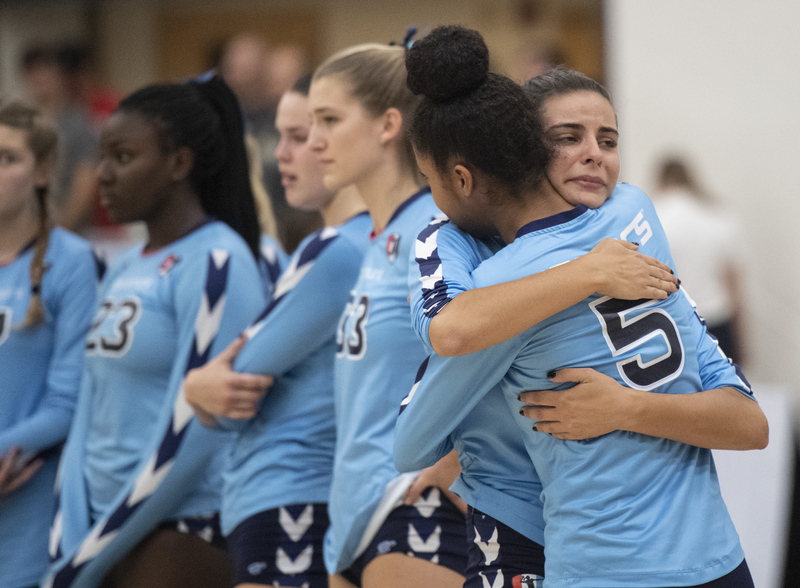 Marymount’s Devon Newberry, right back, accepts MarissŽ Turner after being defeated by Mater Dei in the CIF-SS Department 1 Championship suit at Cerritos University in Norwalk on Saturday, November 3, 2018. (Picture by Kyusung Gong/Contributing Photographer). 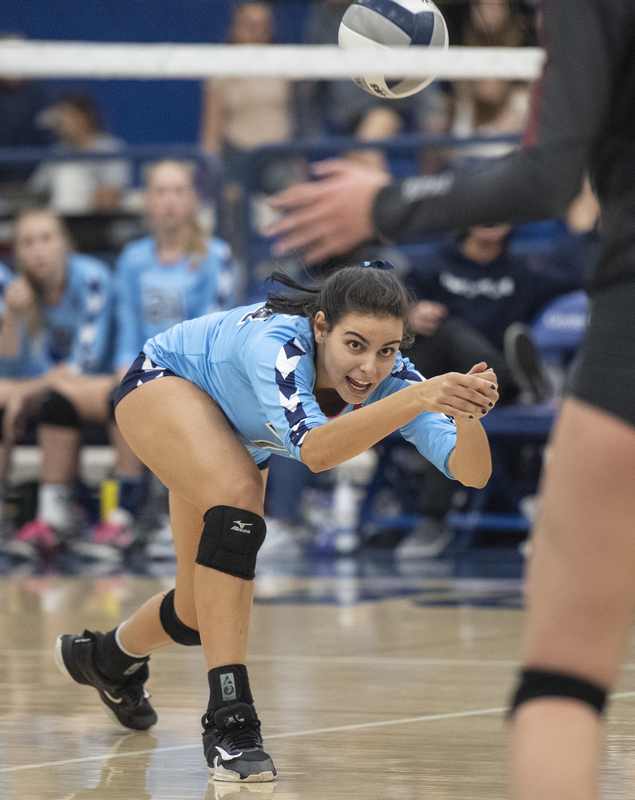 Trabuco Hills’ Kiana Stradford spikes the ball versus Los Alamitos throughout the champion video game of the CIF-SS Division 2 ladies volley ball playoffs Saturday, Nov. 3, 2018 at Cerritos University. 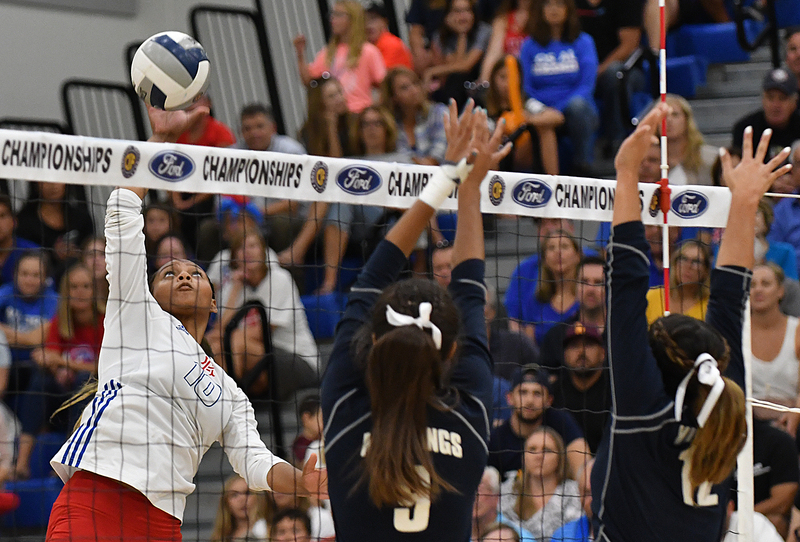 Los Alamitos’ Starr Williams surges the ball versus Trabuco Hills throughout the national championship of the CIF-SS Department 2 girls volleyball playoffs Saturday, Nov. 3, 2018 at Cerritos University. ( Image by Michael Fernandez, Contributing Professional Photographer). 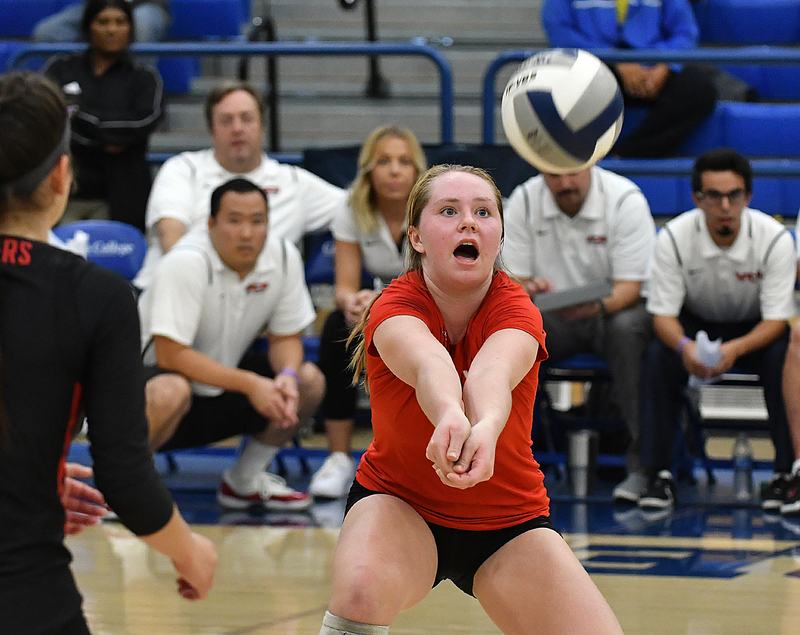 Mater Dei’s Natalie Berty increases the round throughout the CIF-SS Department 1 Championship match against Marymount at Cerritos College in Norwalk on Saturday, November 3, 2018. (Photo by Kyusung Gong/Contributing Professional Photographer). 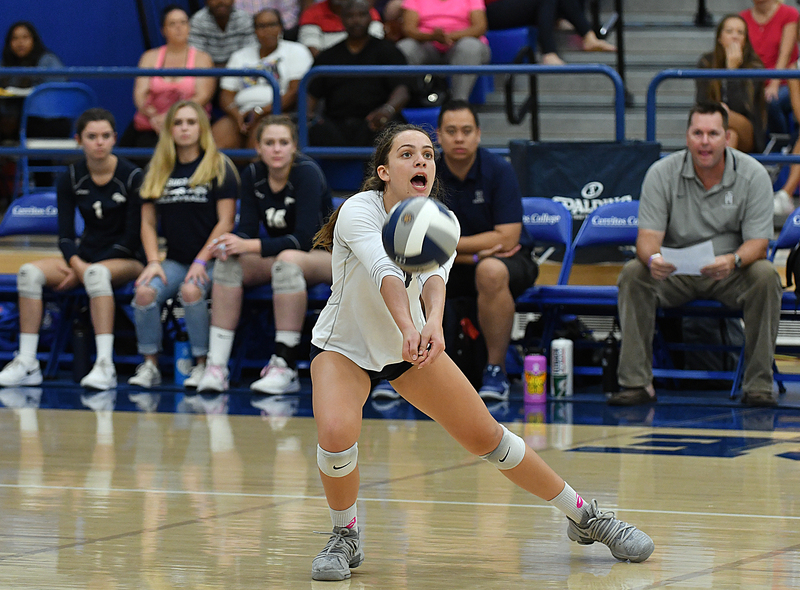 Marymount’s Elia Rubin surges the ball during the CIF-SS Division 1 Champion match against Mater Dei at Cerritos College in Norwalk on Saturday, November 3, 2018. (Picture by Kyusung Gong/Contributing Photographer). 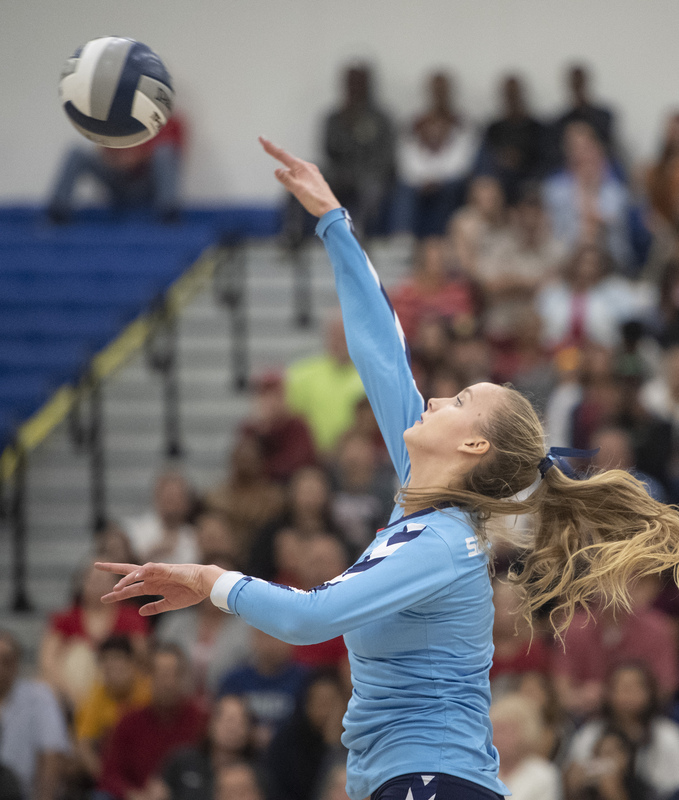 Marymount’s Devon Newberry digs the ball during the CIF-SS Department 1 Champion suit against Mater Dei at Cerritos College in Norwalk on Saturday, November 3, 2018. (Picture by Kyusung Gong/Contributing Digital Photographer). 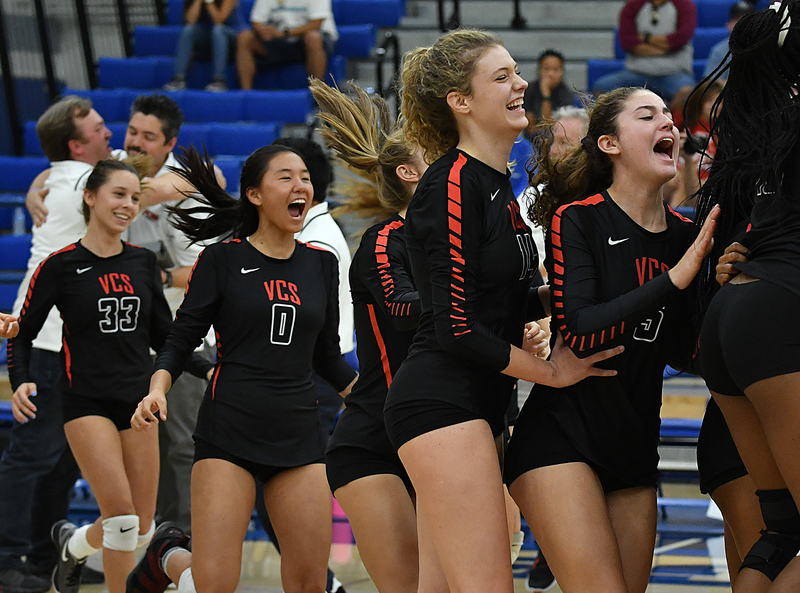 Village Christian gamers celebrate beating Laguna Beach in three collections throughout the champion video game of the CIF-SS Department 3 women volleyball playoffs Saturday, Nov. 3, 2018 at Cerritos University. 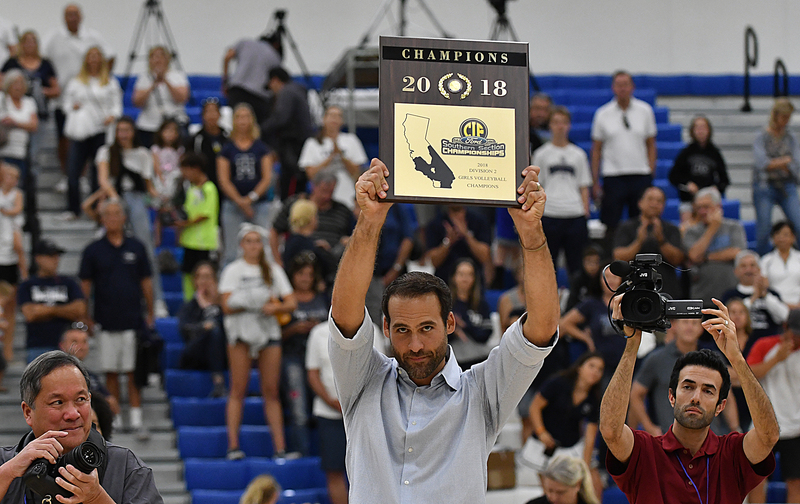 Los Alamitos coach, Dave Huber holds the plaque after defeating Trabuco Hills throughout the national championship of the CIF-SS Division 2 ladies beach ball playoffs Saturday, Nov. 3, 2018 at Cerritos College. 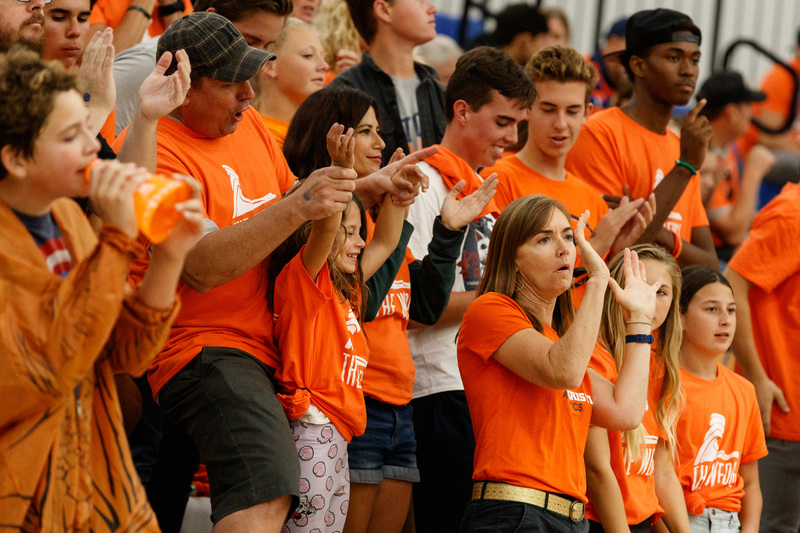 Laguna Beach followers applaud as they play versus Town Christian during the championship video game of the CIF-SS Division 3 women beach ball playoffs Saturday, Nov. 3, 2018 at Cerritos University. 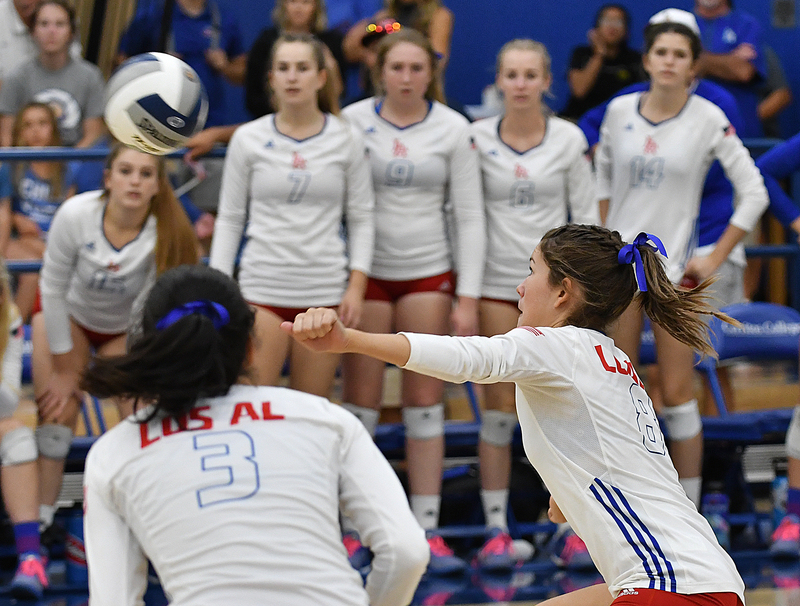 Los Alamitos’ Alexandra Livingston taps the sphere over the internet against Trabuco Hills during the championship video game of the CIF-SS Department 2 girls volley ball playoffs Saturday, Nov. 3, 2018 at Cerritos University. 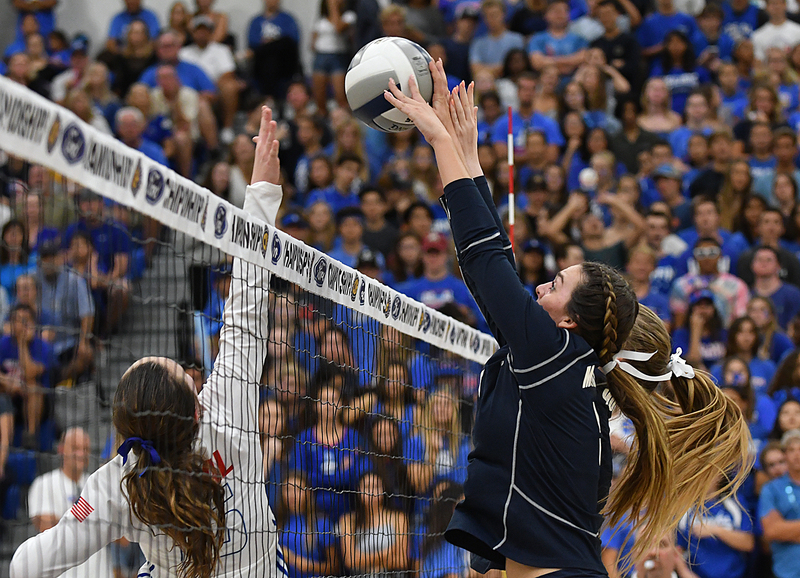 Trabuco Hills’ Emily Corbett digs the ball against Los Alamitos throughout the championship game of the CIF-SS Division 2 girls beach ball playoffs Saturday, Nov. 3, 2018 at Cerritos University. 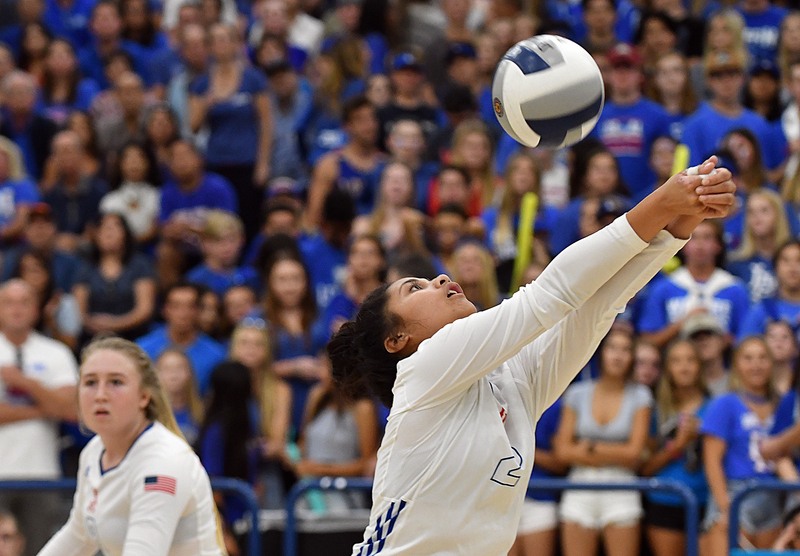 Los Alamitos’ Starr WIlliams increases the sphere against Trabuco Hills during the championship game of the CIF-SS Division 2 women volley ball playoffs Saturday, Nov. 3, 2018 at Cerritos University. 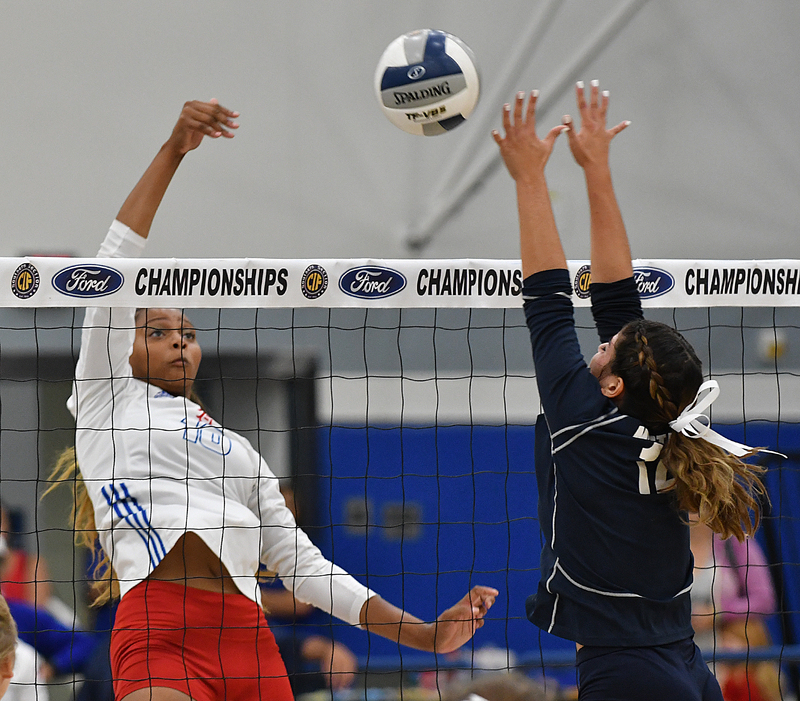 Los Alamitos’ Gabriella Vermeulen spikes the ball against Trabuco Hills’ Kiana Stradford during the championship video game of the CIF-SS Department 2 ladies beach ball playoffs Saturday, Nov. 3, 2018 at Cerritos College. 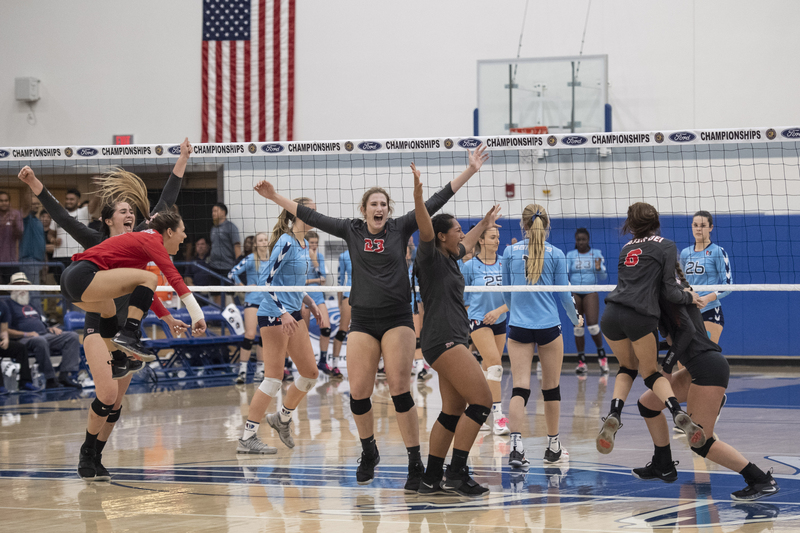 Marymount group celebrate their factor during the CIF-SS Department 1 Champion suit against Mater Dei at Cerritos College in Norwalk on Saturday, November 3, 2018. (Image by Kyusung Gong/Contributing Professional Photographer). 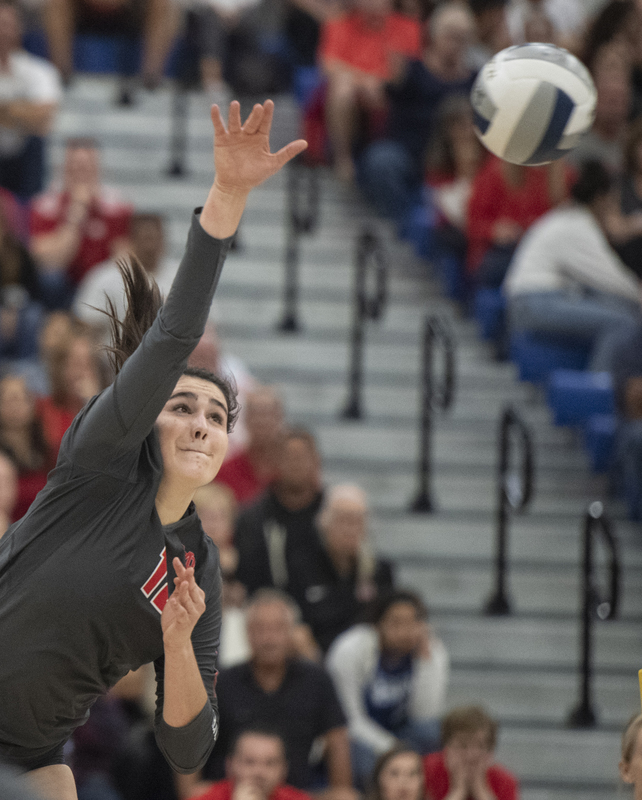 Los Alamitos’ Rachel Roberts attempts to return the round against Trabuco Hills during the national championship of the CIF-SS Division 2 ladies volley ball playoffs Saturday, Nov. 3, 2018 at Cerritos College. 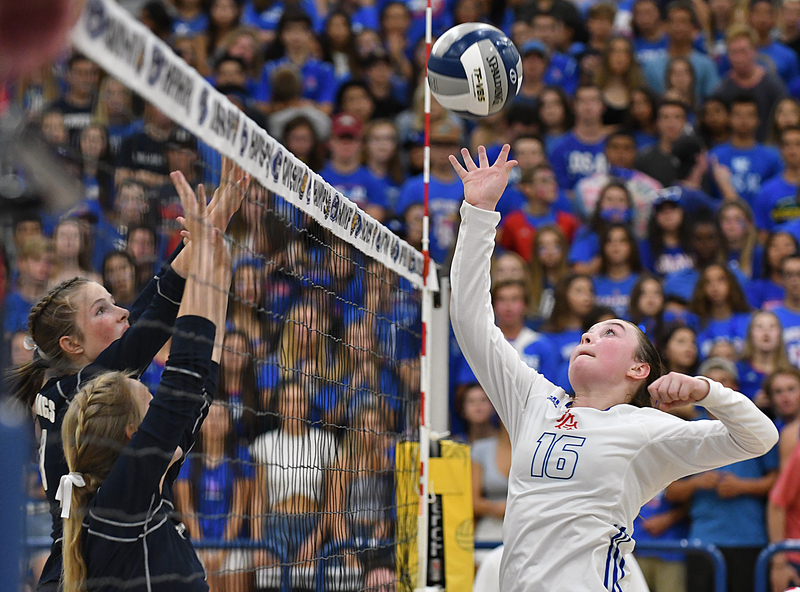 Marymount’s Grace Frohling surges the round during the CIF-SS Division 1 Champion suit versus Mater Dei at Cerritos University in Norwalk on Saturday, November 3, 2018. (Photo by Kyusung Gong/Contributing Professional Photographer). 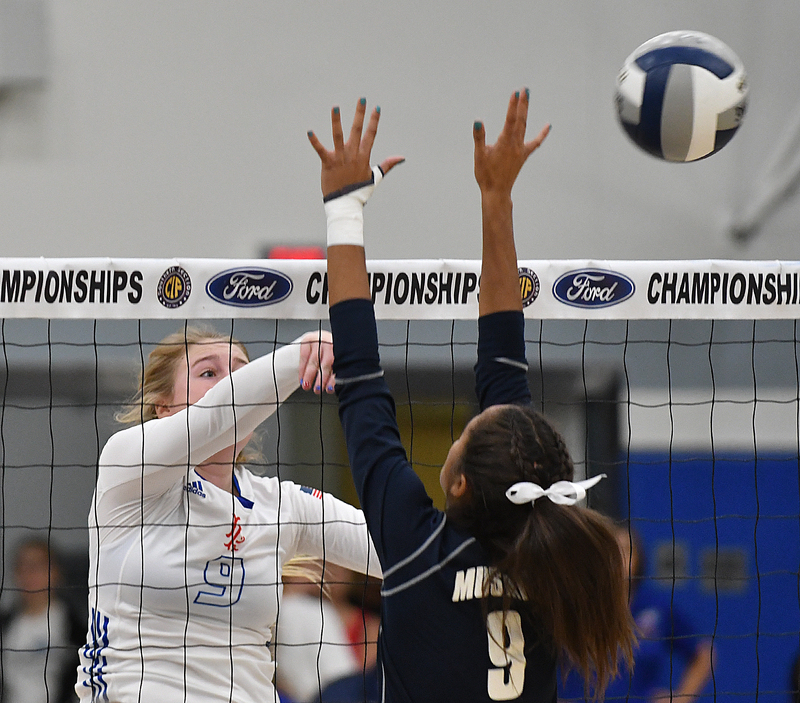 Marymount’s Taylor Fourticq, center, establishes up throughout the CIF-SS Division 1 Champion suit versus Mater Dei at Cerritos University in Norwalk on Saturday, November 3, 2018. (Photo by Kyusung Gong/Contributing Digital Photographer). 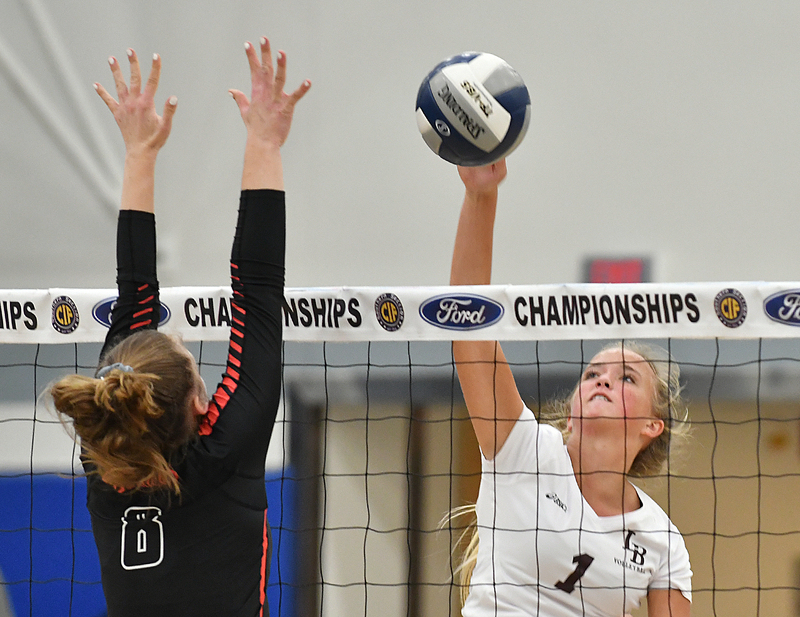 Laguna Coastline’s Ella Tyus increases the round against Town Christian during the champion video game of the CIF-SS Department 3 girls volley ball playoffs Saturday, Nov. 3, 2018 at Cerritos College. 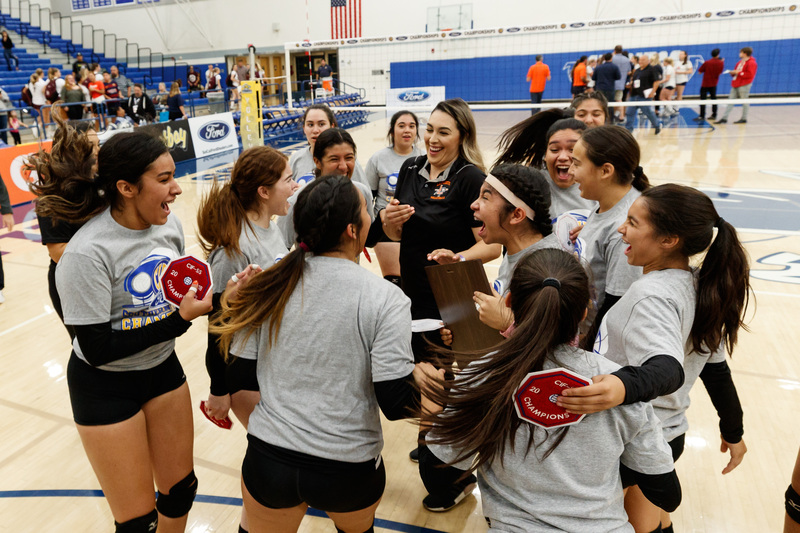 La Puente Warriors celebrates after wining the CIF-SS Girls Division 9 Champion suit versus the Pacifica Christian Tritons at Cerritos College in Norwalk, Calif. on Saturday November 3, 2018. La Puente defeated Pacifica Christian 3-2. (Image by Raul Romero Jr, Adding Photographer). 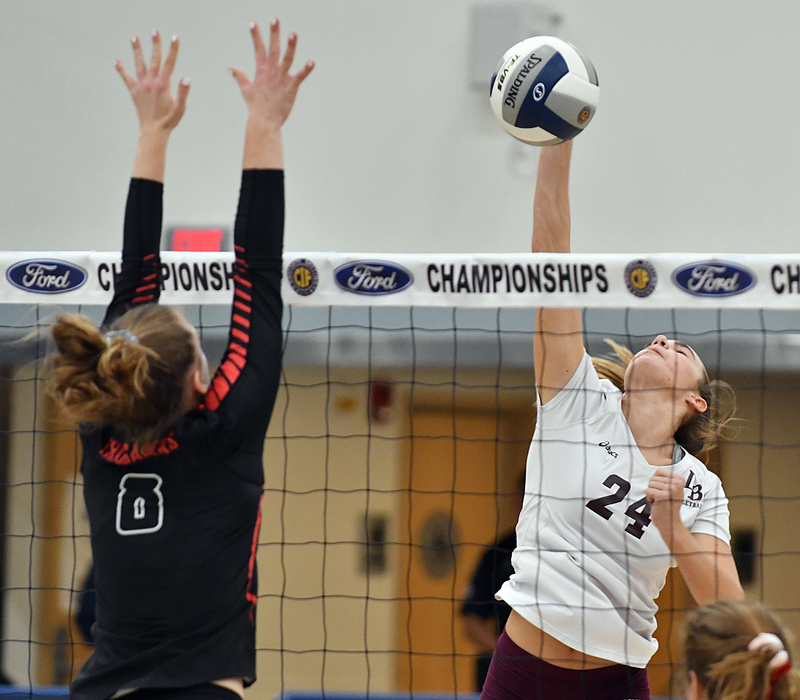 Laguna Coastline’s Cambria Hall digs the round against Town Christian during the national championship of the CIF-SS Division 3 women volleyball playoffs Saturday, Nov. 3, 2018 at Cerritos College. 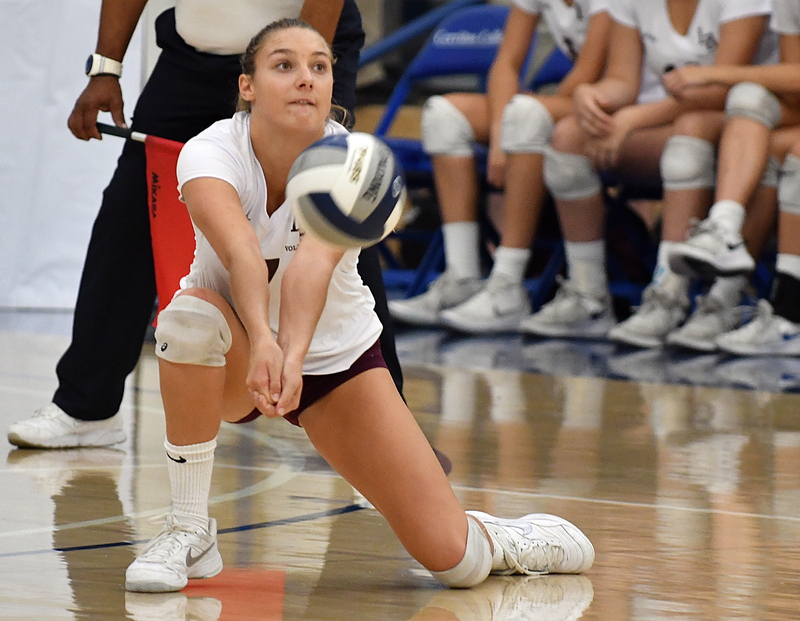 Laguna Beach’s Mikayla Smith returns the sphere against Village Christian during the championship game of the CIF-SS Division 3 ladies volley ball playoffs Saturday, Nov. 3, 2018 at Cerritos College. 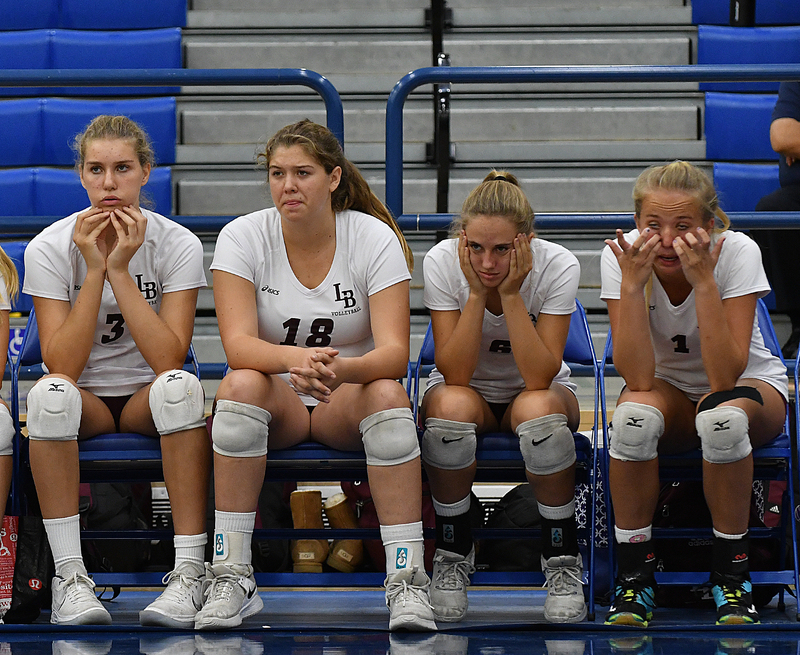 Laguna Beach players respond as they are losing to Town Christian throughout the national championship of the CIF-SS Department 3 ladies volley ball playoffs Saturday, Nov. 3, 2018 at Cerritos University. 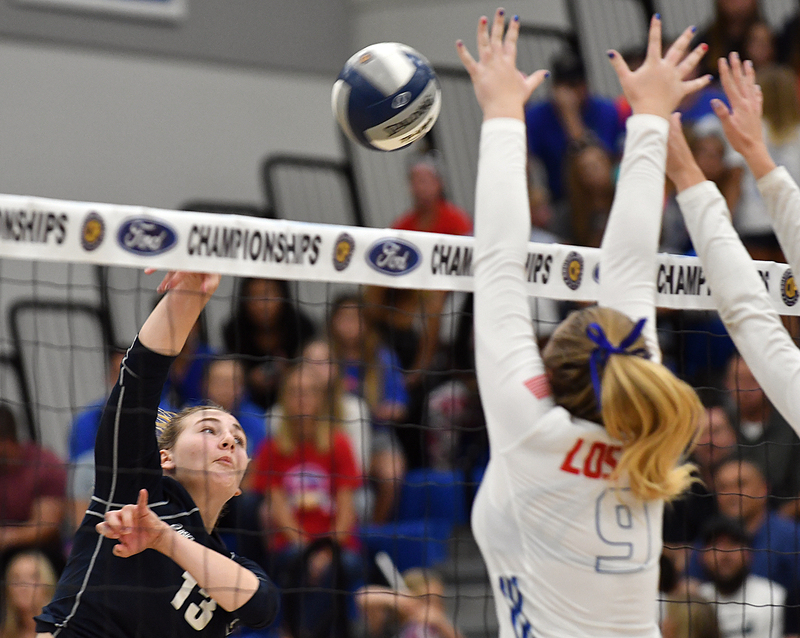 Laguna Coastline’s Soren Patchell establishes the ball versus Town Christian throughout the national championship of the CIF-SS Division 3 ladies volley ball playoffs Saturday, Nov. 3, 2018 at Cerritos College. ( Picture by Michael Fernandez, Adding Professional Photographer). 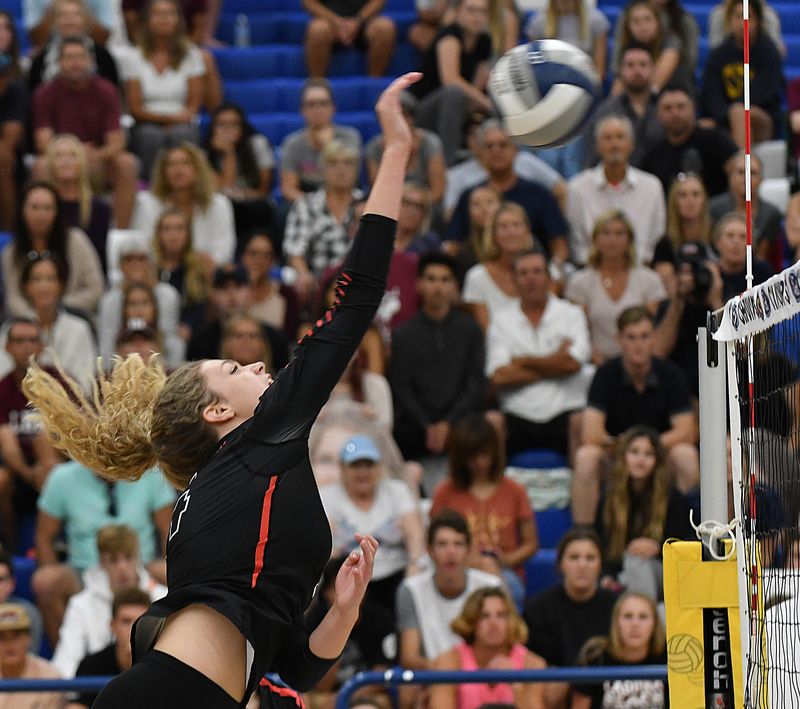 Village Christian’s Campbell Jensen establishes the round against Laguna Coastline throughout the national championship of the CIF-SS Division 3 girls beach ball playoffs Saturday, Nov. 3, 2018 at Cerritos College. 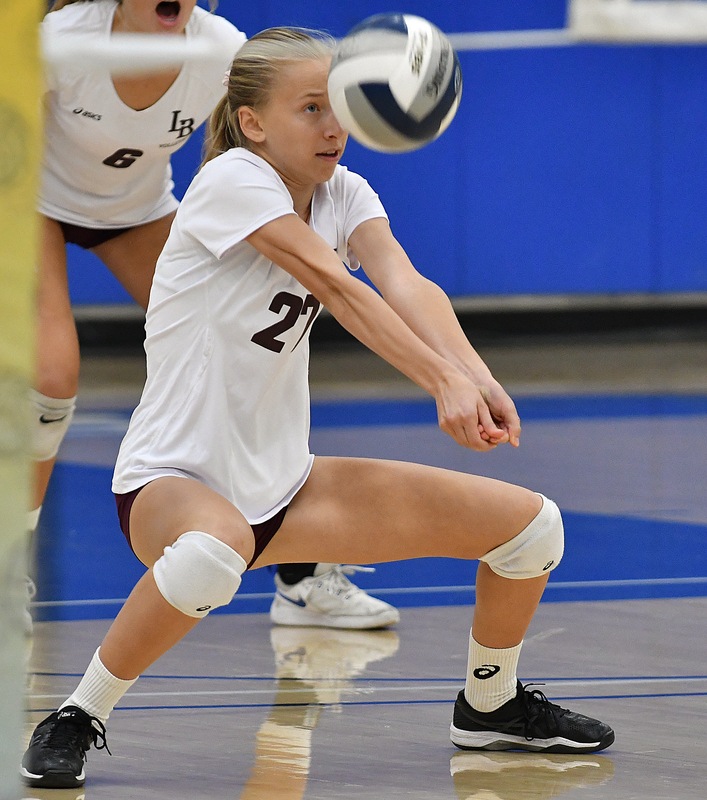 Town Christian’s Mackenzie Jensen increases the ball versus Laguna Beach throughout the champion game of the CIF-SS Department 3 girls volley ball playoffs Saturday, Nov. 3, 2018 at Cerritos College. 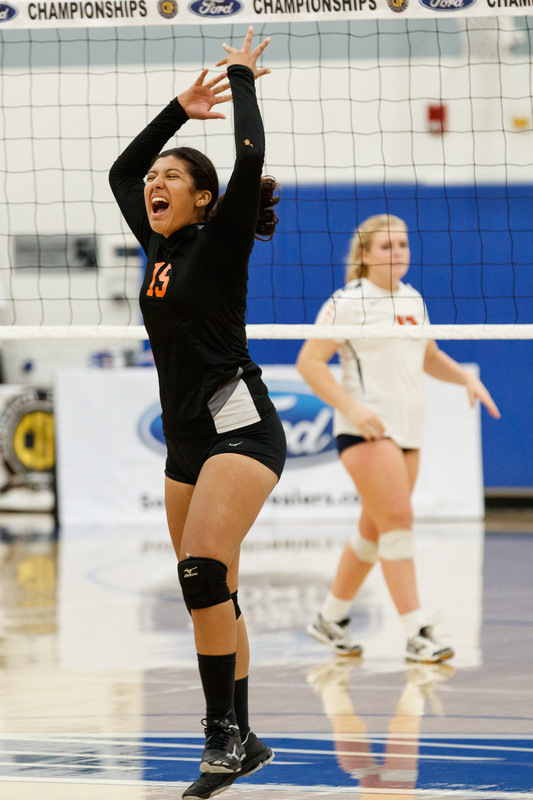 La Puente Warriors Kayla Morales (15) commemorates as her team scores a point against the Pacifica Christian Tritons throughout the CIF-SS Girls Department 9 Champion suit at Cerritos College in Norwalk, Calif. on Saturday November 3, 2018. La Puente beat Pacifica Christian 3-2. (Photo by Raul Romero Jr, Adding Professional Photographer). 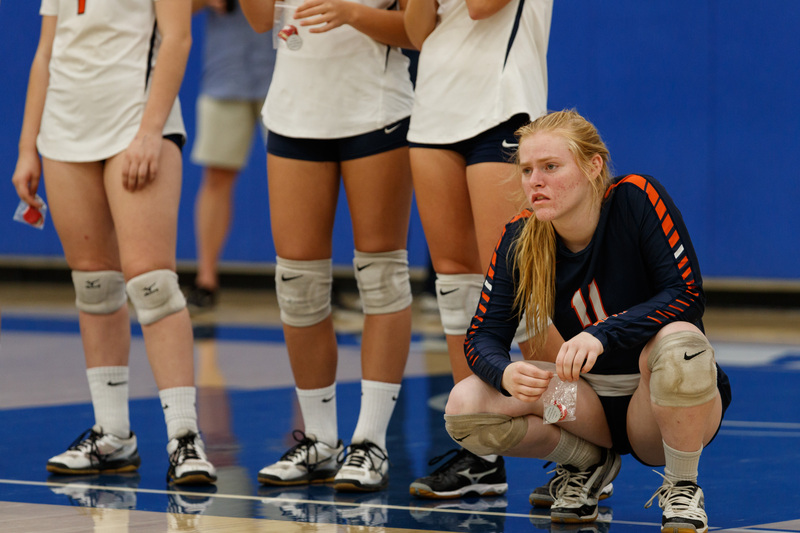 Pacifica Christian Tritons Annika Bahnsen (11) views on as La Puente Warriors get their honors at the end of the CIF-SS Girls Department 9 Champion suit at Cerritos College in Norwalk, Calif. on Saturday November 3, 2018. La Puente defeated Pacifica Christian 3-2. (Photo by Raul Romero Jr, Adding Digital Photographer). 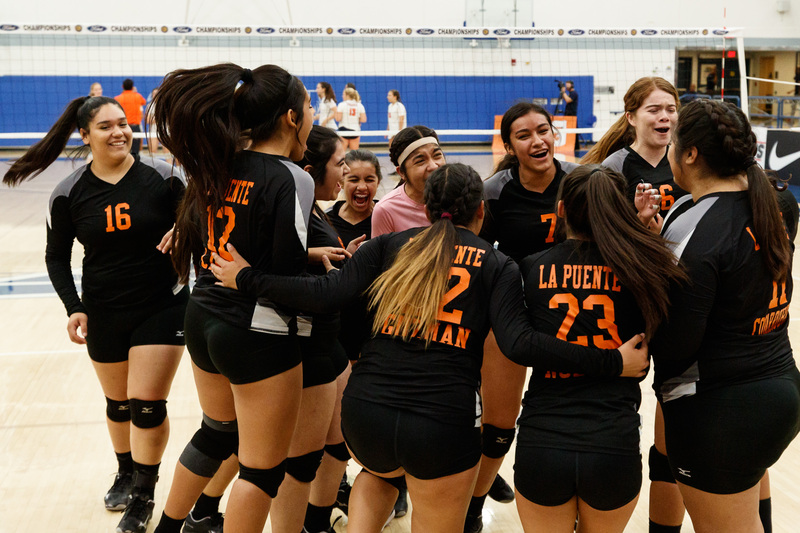 La Puente Warriors commemorate after winning the CIF-SS Girls Department Nine Champion suit versus the Pacifica Christian Tritons at Cerritos College in Norwalk, Calif. on Saturday November 3, 2018. La Puente defeated Pacifica Christian 3-2. (Image by Raul Romero Jr, Contributing Digital Photographer). 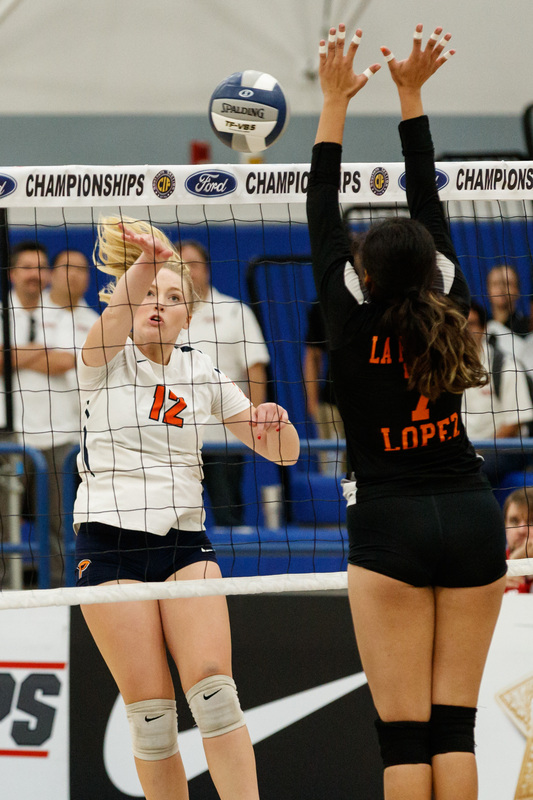 La Puente Warriors Alma Lopez (7) surges the round at the internet versus the Pacifica Christian Tritonsduring the CIF-SS Girls Department 9 Championship match at Cerritos University in Norwalk, Calif. on Saturday November 3, 2018. La Puente beat Pacifica Christian 3-2. (Photo by Raul Romero Jr, Contributing Professional Photographer). 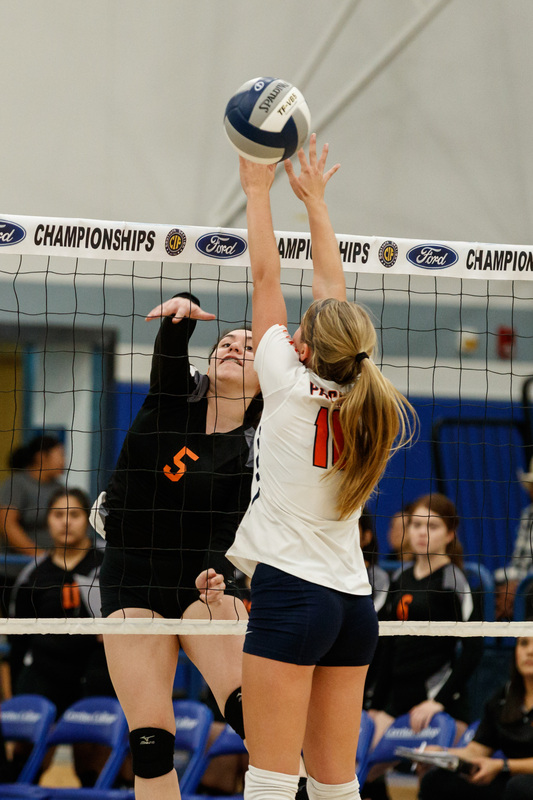 La Puente Warriors Kimberly Boring (5) hits the round as Pacifica Christian Tritons Allyson Scharrer (10) tries a block during the CIF-SS Girls Division Nine Championship suit at Cerritos College in Norwalk, Calif. on Saturday November 3, 2018. La Puente beat Pacifica Christian 3-2. (Image by Raul Romero Jr, Adding Photographer). Pacifica Christian Tritons Hailey MacKay (3) and La Puente Warriors Kimberly Boring (5) fight at the web for the ball during the CIF-SS Girls Division 9 Champion suit at Cerritos University in Norwalk, Calif. on Saturday November 3, 2018. La Puente defeated Pacifica Christian 3-2. (Photo by Raul Romero Jr, Contributing Photographer). 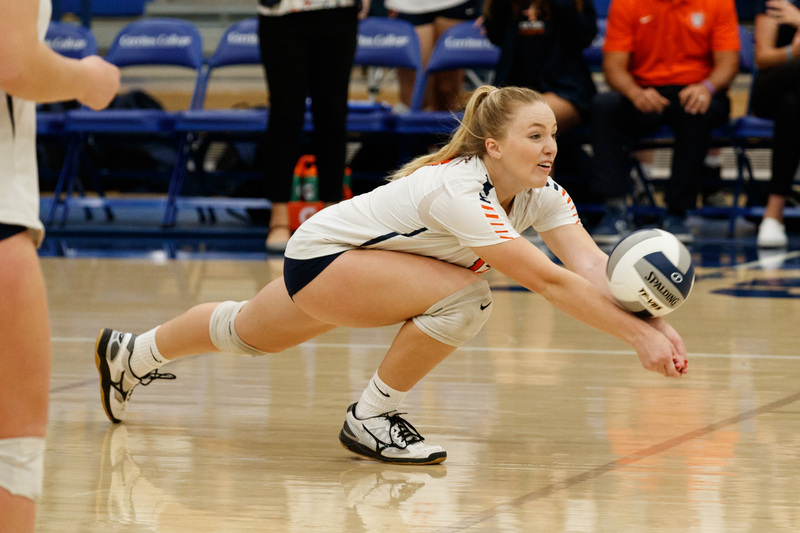 Pacifica Christian Tritons Hailey MacKay (3) strikes the ball against the La Puente Warriors defenders throughout the CIF-SS Girls Division Nine Champion match at Cerritos College in Norwalk, Calif. on Saturday November 3, 2018. La Puente defeated Pacifica Christian 3-2. (Image by Raul Romero Jr, Contributing Photographer). 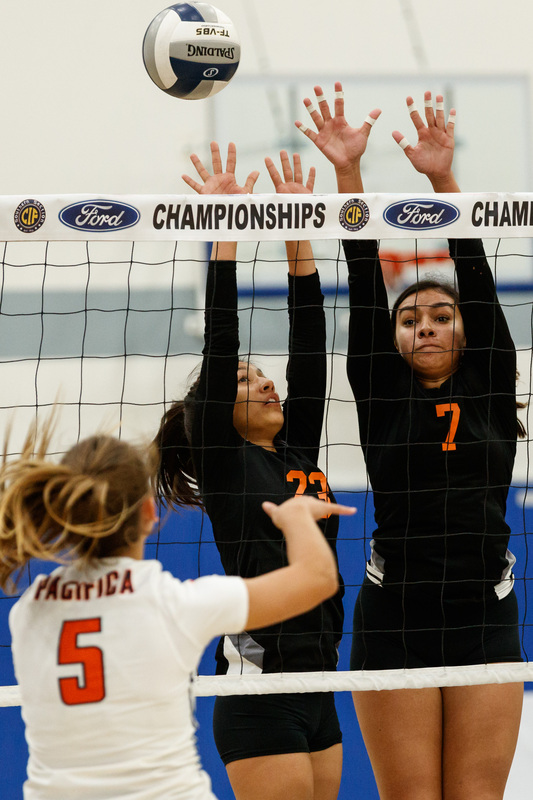 La Puente Warriors Alma Lopez (7) as well as Johie Noetzel (23) jump to block the round by a hit from Pacifica Christian Tritons Maggie OÕCallaghan (5) throughout the CIF-SS Girls Division 9 Championship suit at Cerritos University in Norwalk, Calif. on Saturday November 3, 2018. La Puente beat Pacifica Christian 3-2. (Picture by Raul Romero Jr, Contributing Professional Photographer). 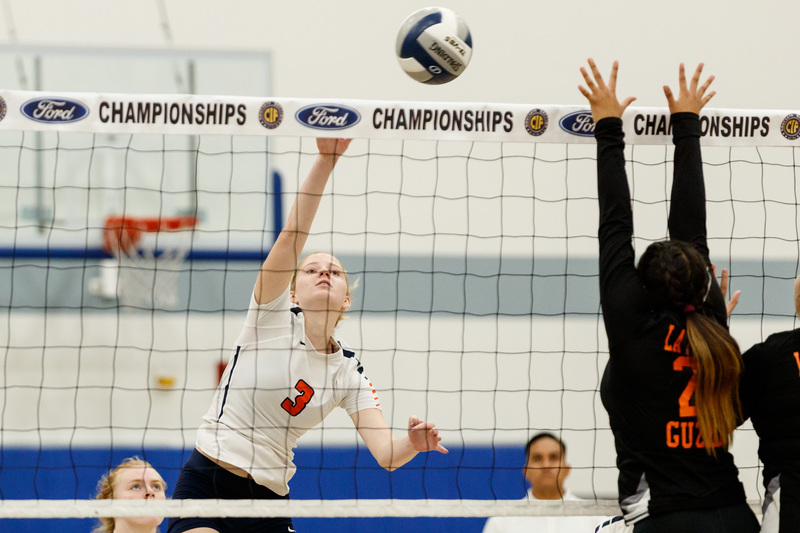 Pacifica Christian Tritons Allyson Scharrer (10) tries to block the sphere versus the La Puente Warriors throughout the CIF-SS Girls Department 9 Championship suit at Cerritos College in Norwalk, Calif. on Saturday November 3, 2018. La Puente defeated Pacifica Christian 3-2. (Photo by Raul Romero Jr, Adding Professional Photographer). 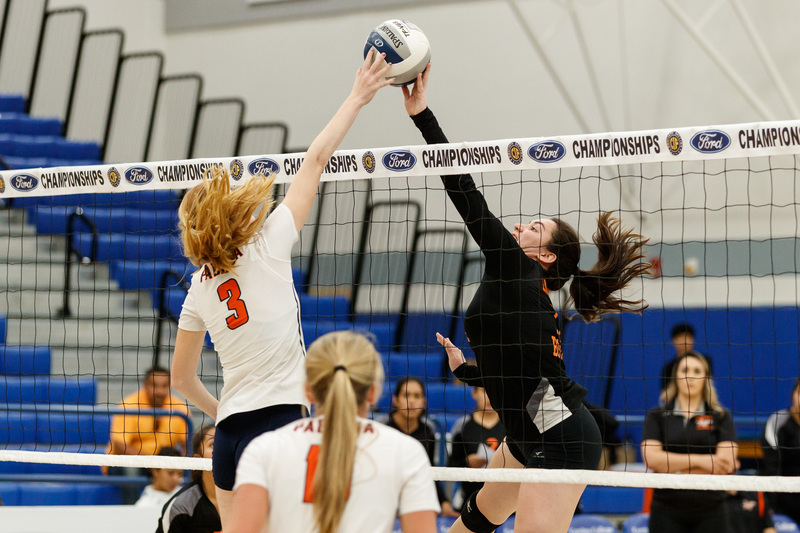 Pacifica Christian Tritons Hailey MacKay (3) spikes the ball versus the La Puente Warriors throughout the CIF-SS Girls Division 9 Champion suit at Cerritos College in Norwalk, Calif. on Saturday November 3, 2018. La Puente defeated Pacifica Christian 3-2. (Image by Raul Romero Jr, Adding Photographer). 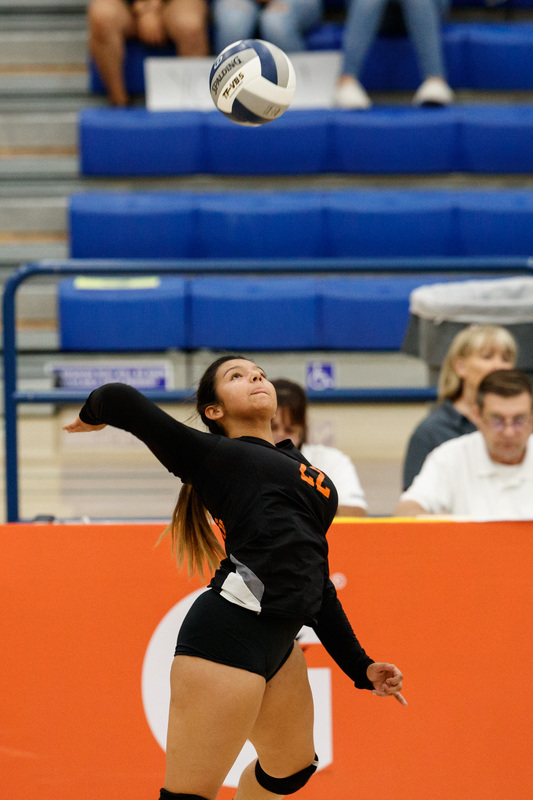 La Puente Warriors Leilani Guzman (22) leaps for the ball versus the Pacifica Christian Tritons during the CIF-SS Girls Department Nine Champion suit at Cerritos University in Norwalk, Calif. on Saturday November 3, 2018. La Puente defeated Pacifica Christian 3-2. (Picture by Raul Romero Jr, Contributing Professional Photographer). 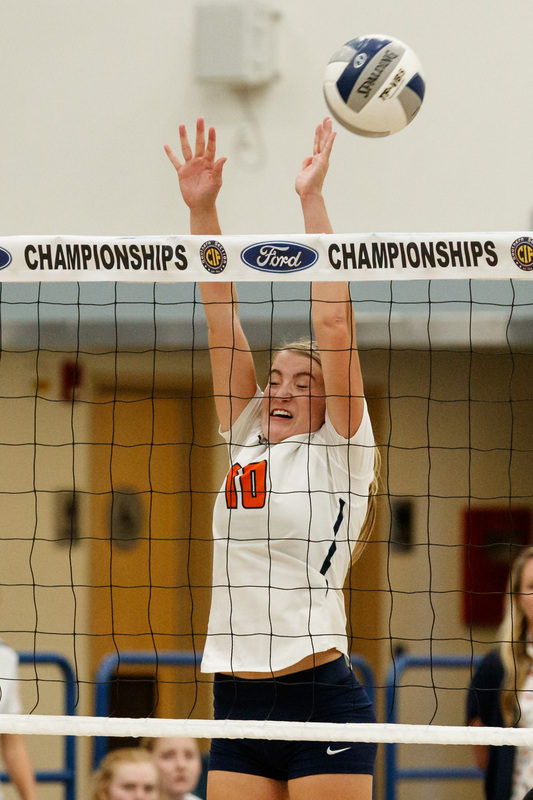 Pacifica Christian Tritons Allyson Scharrer (10) volleys the round during the CIF-SS Girls Department Nine Champion suit against the La Puente Warriors at Cerritos College in Norwalk, Calif. on Saturday November 3, 2018. La Puente beat Pacifica Christian 3-2. (Picture by Raul Romero Jr, Contributing Photographer). 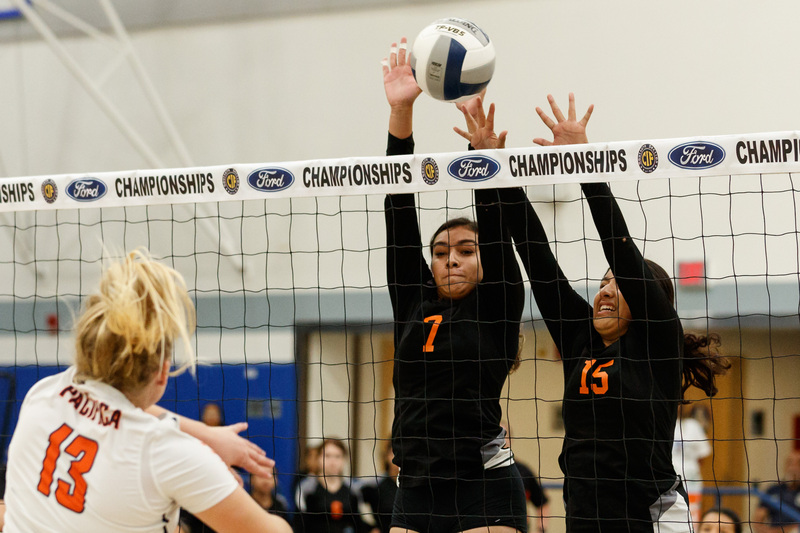 Pacifica Christian Tritons Breck Burwell (12) hits the sphere toward La Puente Warriors Alma Lopez (7) during the CIF-SS Girls Department 9 Champion match at Cerritos College in Norwalk, Calif. on Saturday November 3, 2018. La Puente defeated Pacifica Christian 3-2. (Photo by Raul Romero Jr, Contributing Digital Photographer). 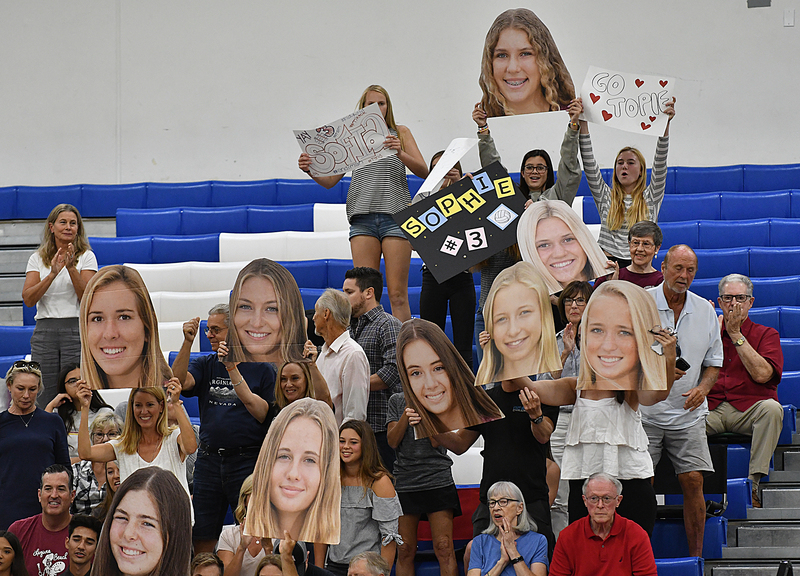 La Puente Warriors supporters react to a score against the Pacifica Christian Tritons during the CIF-SS Girls Department Nine Champion match at Cerritos College in Norwalk, Calif. on Saturday November 3, 2018. La Puente beat Pacifica Christian 3-2. (Image by Raul Romero Jr, Adding Photographer).